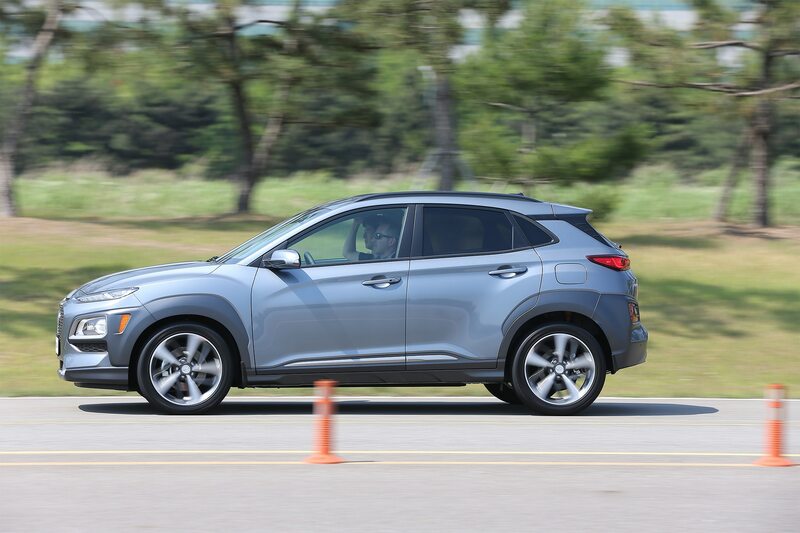 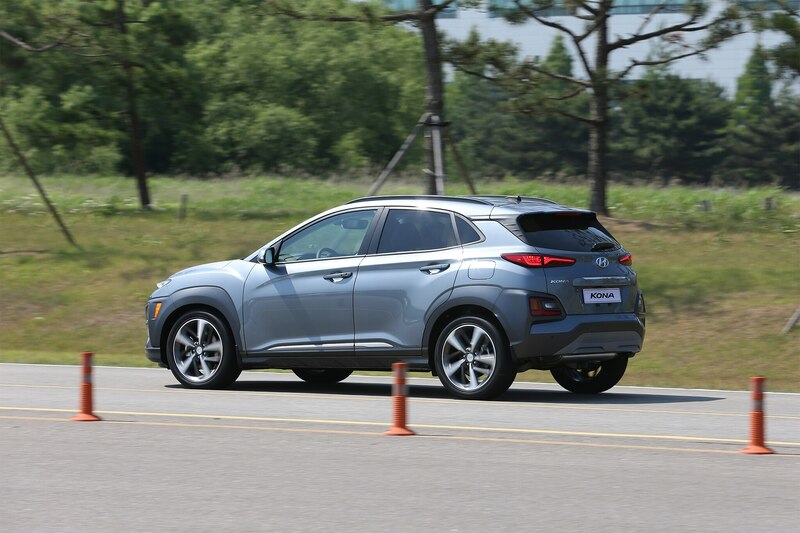 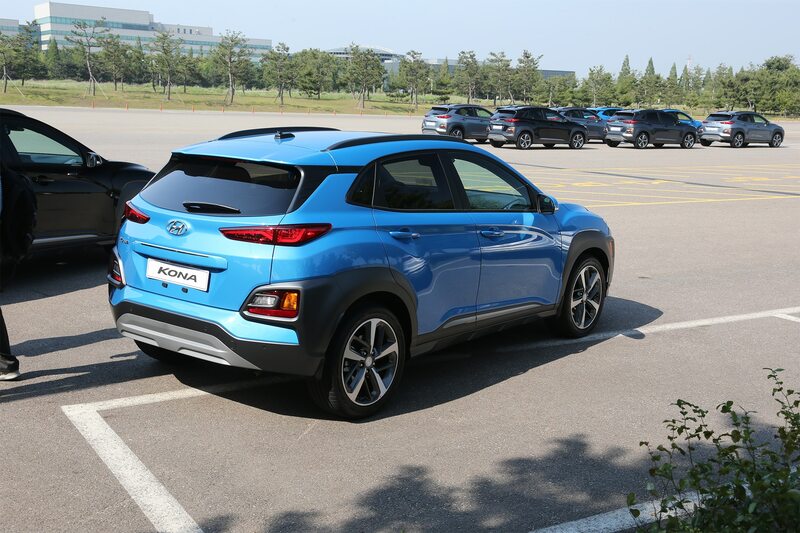 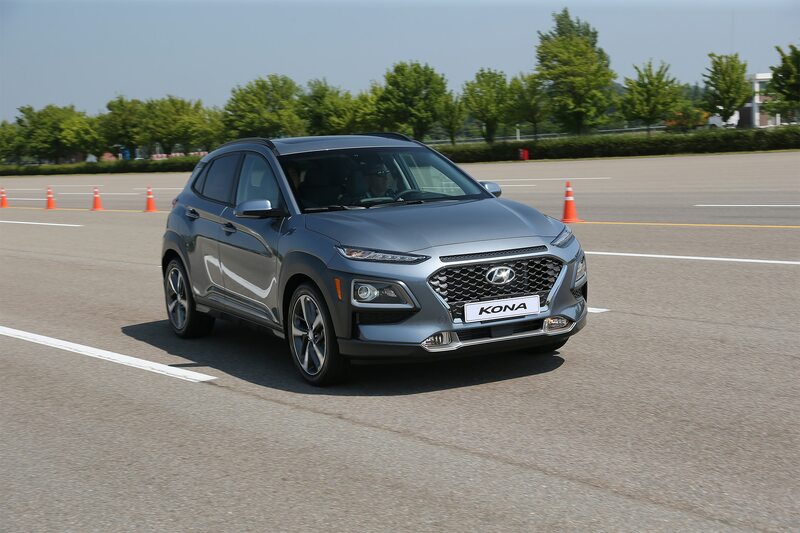 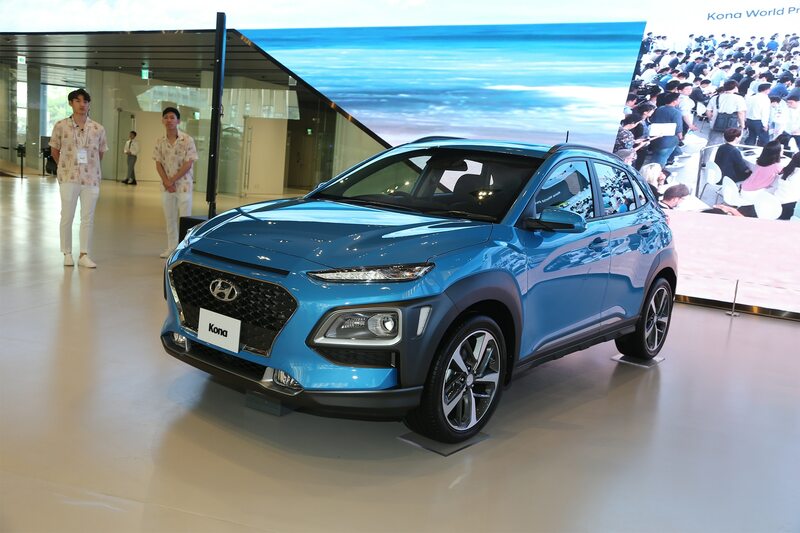 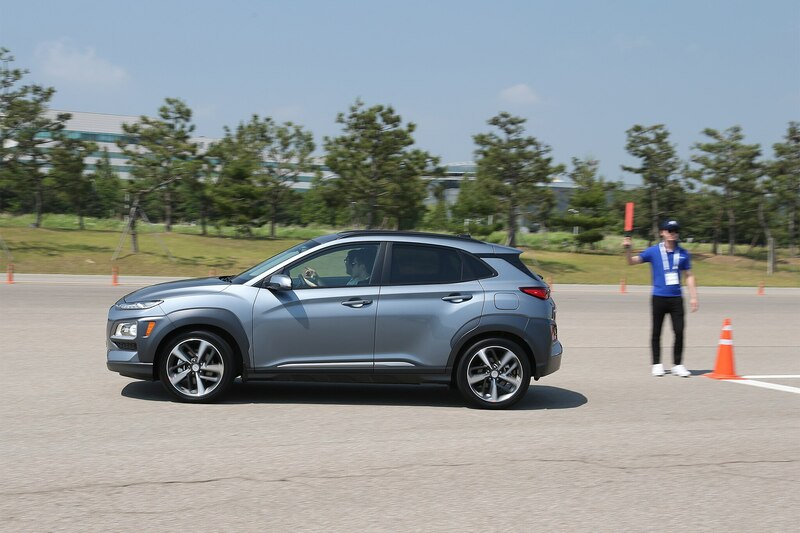 NAMYANG, South Korea – Amidst Hyundai’s sprawling, city-like research and development center, a gaggle of 2018 Kona crossovers awaits on the test-track ahead. 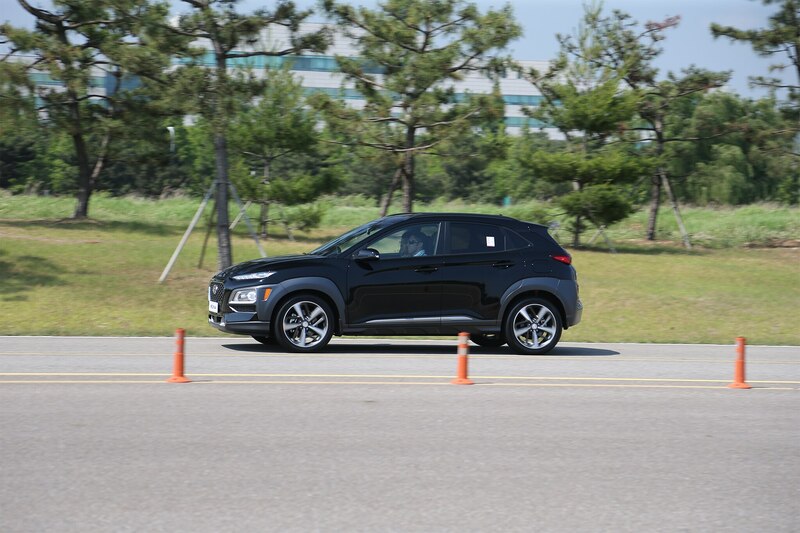 Camouflaged and black vinyl-cladded prototypes zip by as finely-dressed security personnel hover silently, observing as we hop into the driver’s seat for our rather brief eight-minute runabout on Hyundai’s hometown handling course. 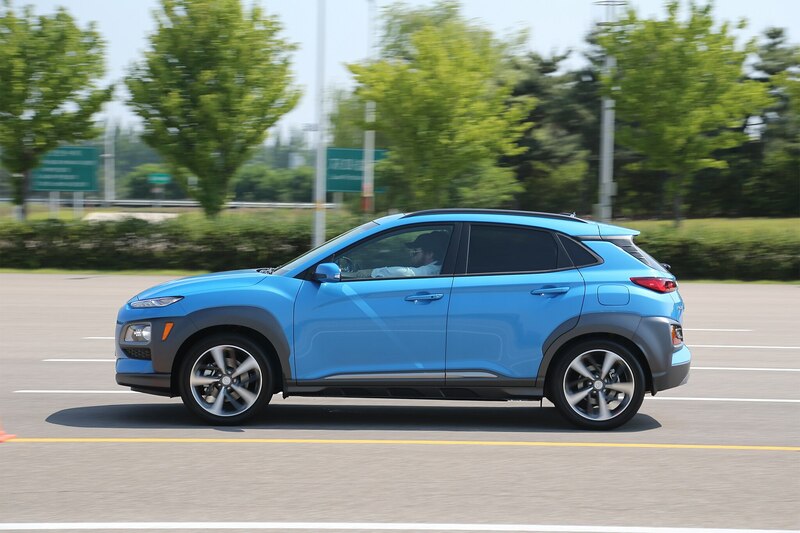 Hyundai won’t launch the Kona in the U.S. until March 2018, well behind the now-established Honda HR-V, Mazda CX-3, Jeep Renegade, and more recent Toyota C-HR. 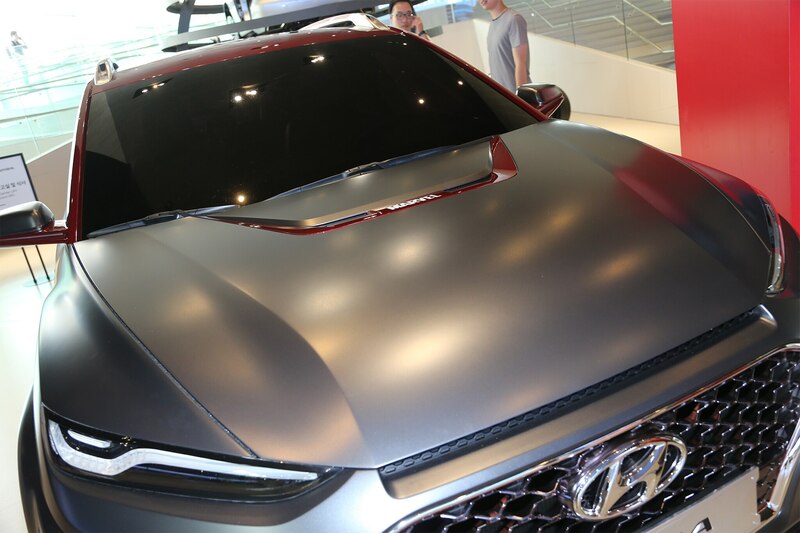 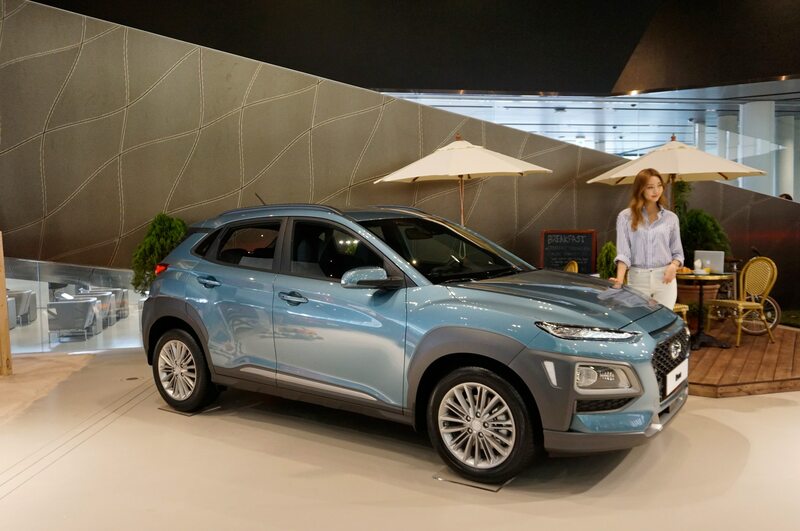 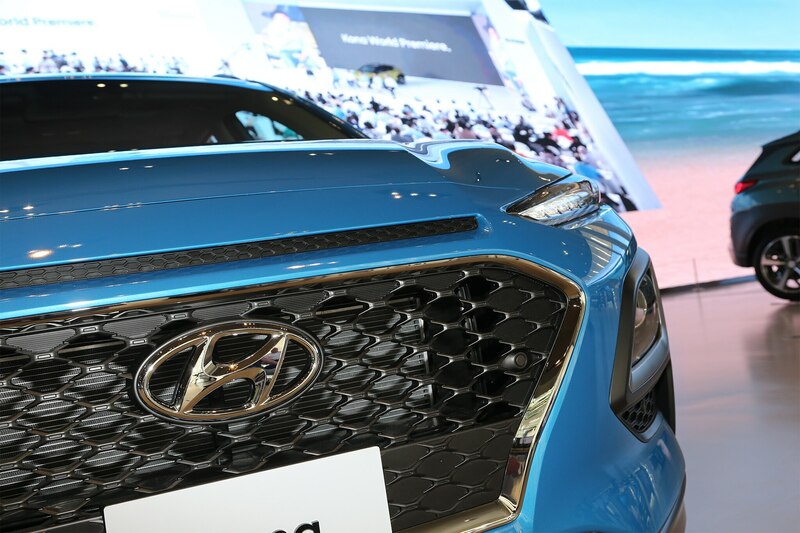 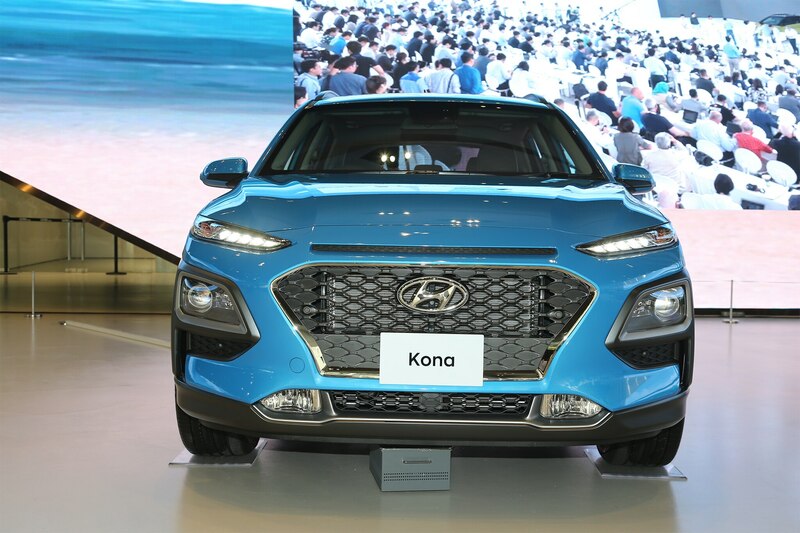 “We needed to take the time to make sure we got things right for the market and for our customers,” said Hyundai vice chairman Chung Eui-Sun. 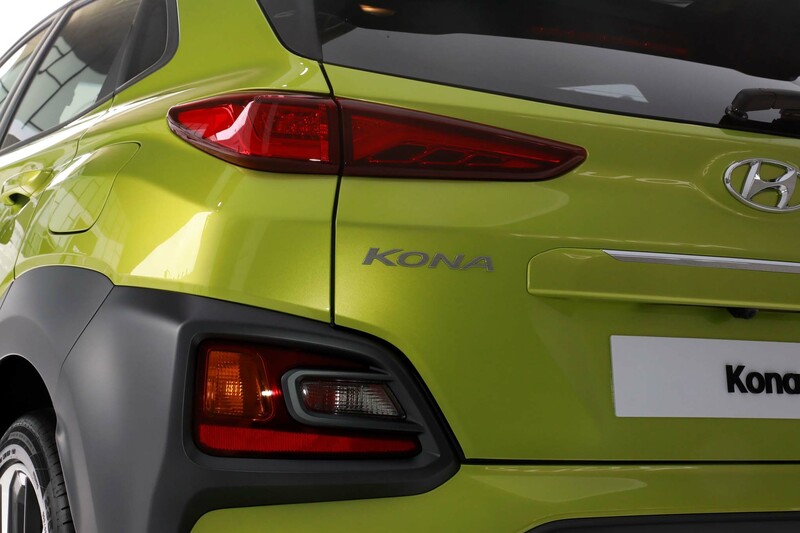 Based on our very limited drive of a pre-production Korean-spec Kona, Hyundai will have a solid shot at scooping up what’s left of this booming segment. 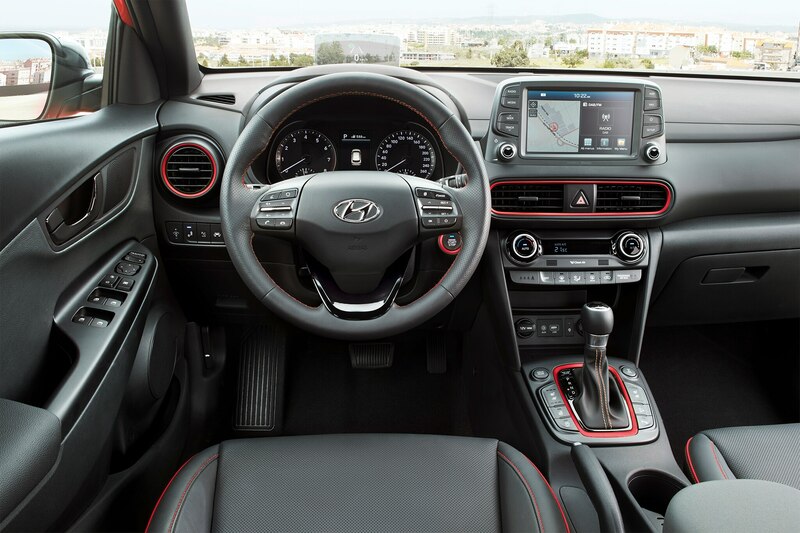 Our test car is a loaded example that boasts the optional combination of a 1.6-liter turbo-four and seven-speed dual-clutch automatic. 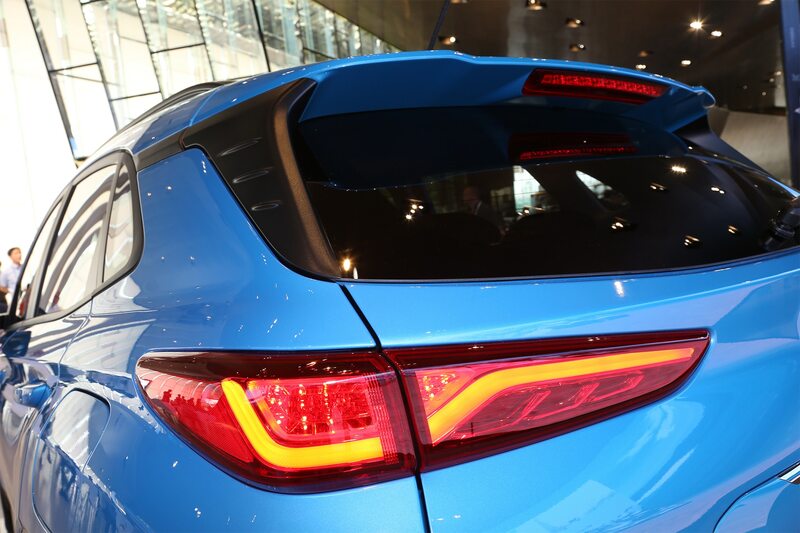 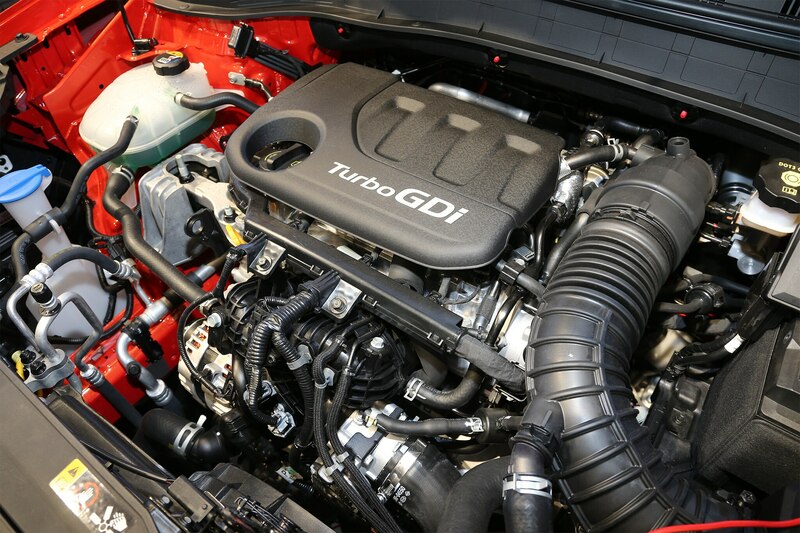 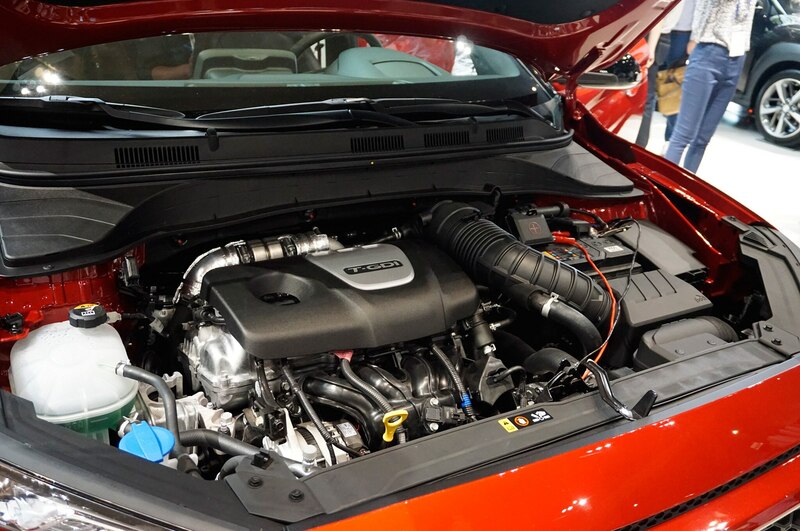 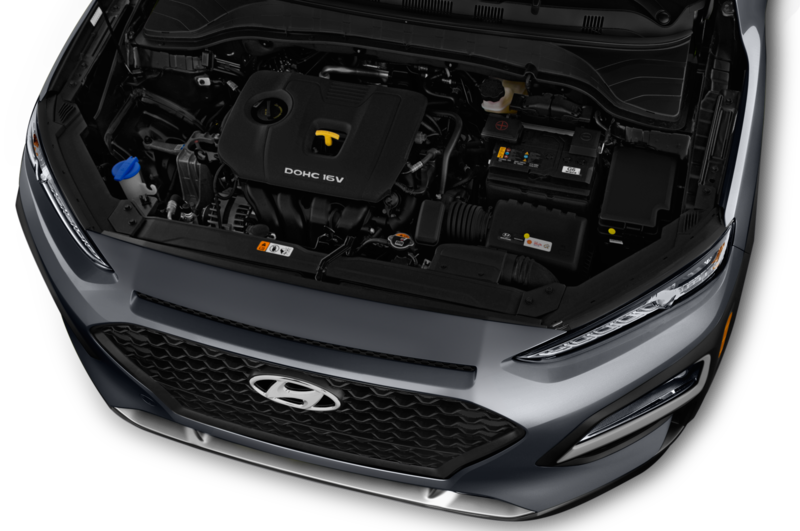 As in previous models, such as the Veloster Turbo and Sonata Eco, the engine makes 175 hp and a healthy 195 lb-ft of torque from 1,500 to 4,500 RPM. 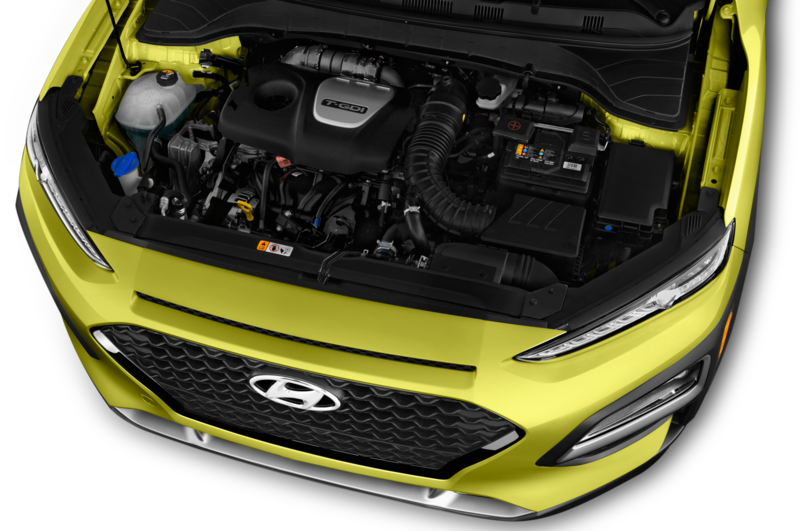 The base engine will be a 2.0-liter Atkinson cycle four good for 147 hp and 132 lb-ft of torque paired with a six-speed automatic. 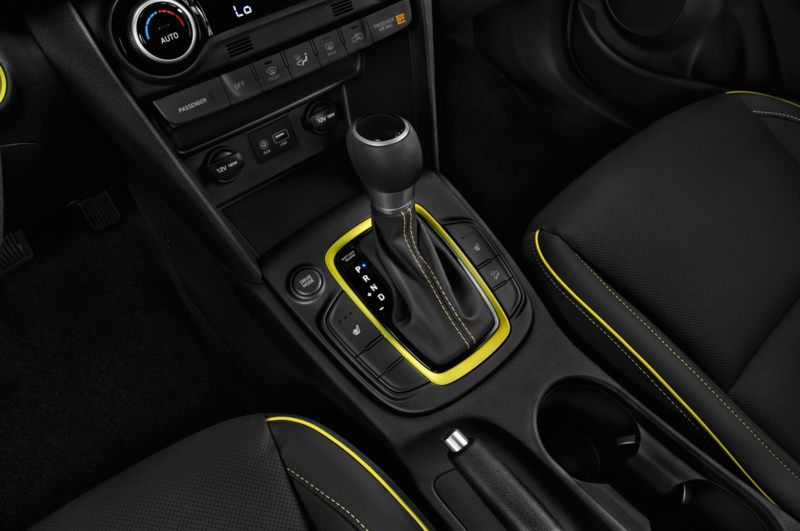 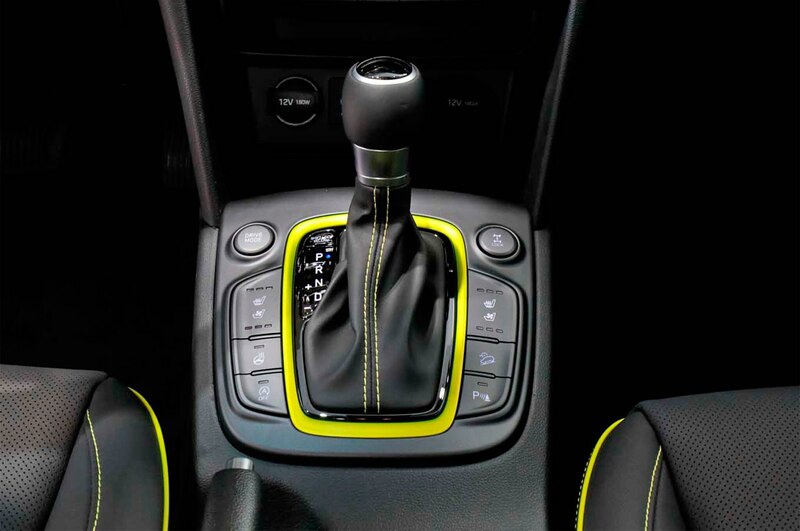 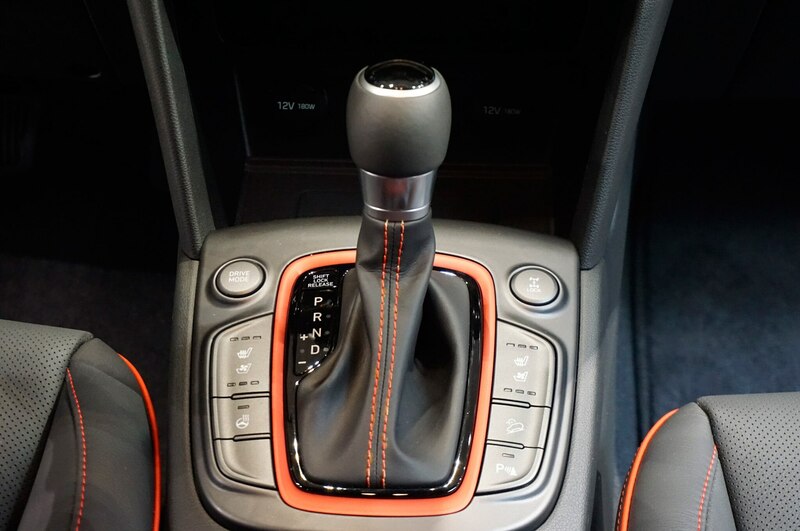 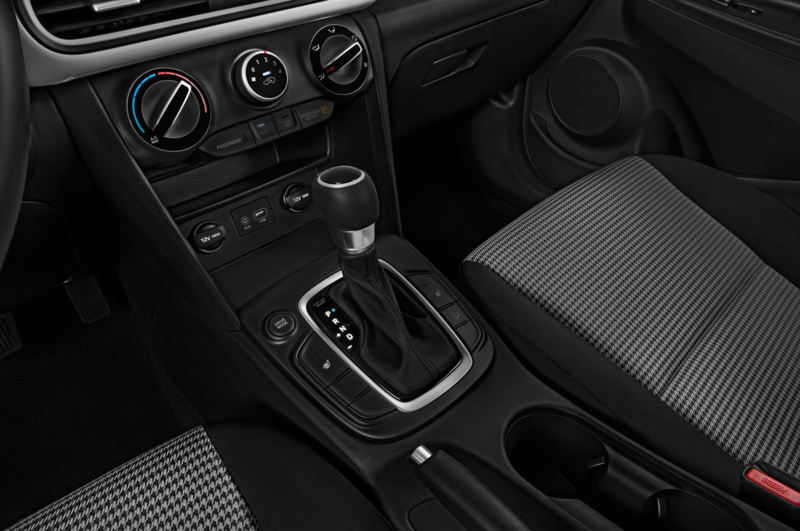 Drive modes include Normal and Sport, with the latter adding slightly heavier steering, sharper throttle sensitivity, and a sportier transmission mapping that downshifts earlier under braking and holds gears longer under heavy throttle input. 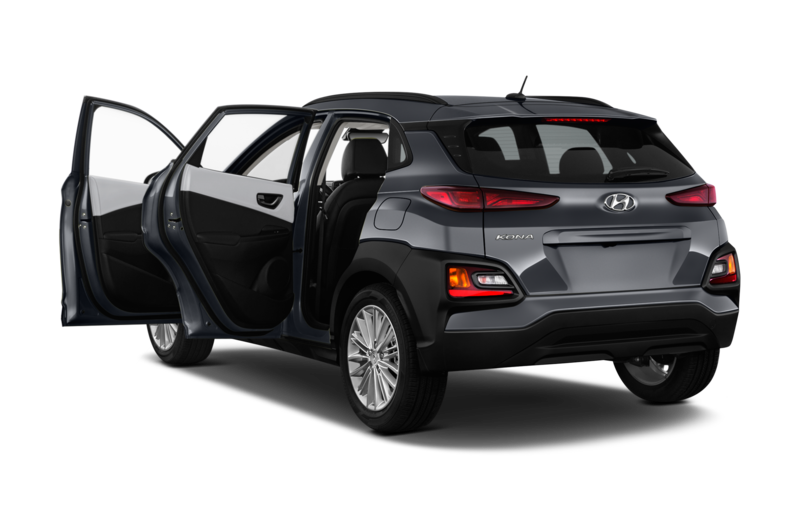 Other markets will also get an Eco option that, somewhat amusingly, isn’t included for U.S. models; experience taught Hyundai that customers often unknowingly leave the drive mode in Eco and then complain the car is underpowered. 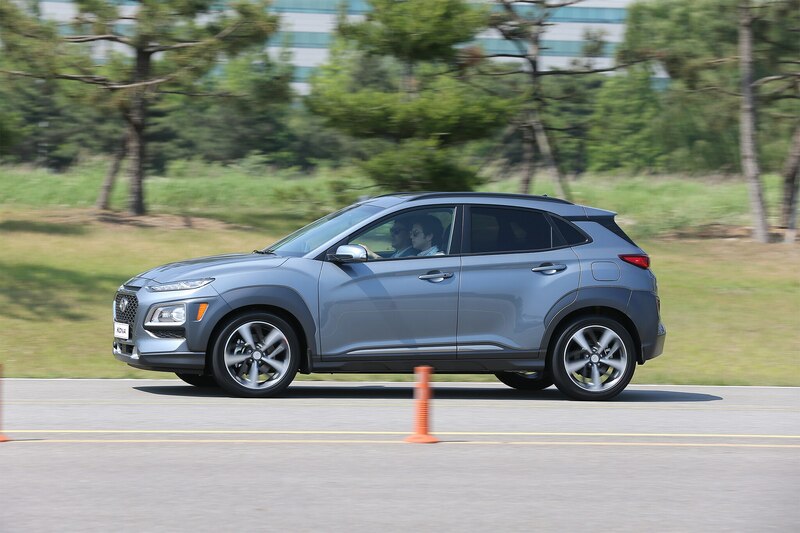 Down the long straightaway at the beginning of our test run, the punchy little engine impressed with its generous low-end torque and smooth-shifting transmission. 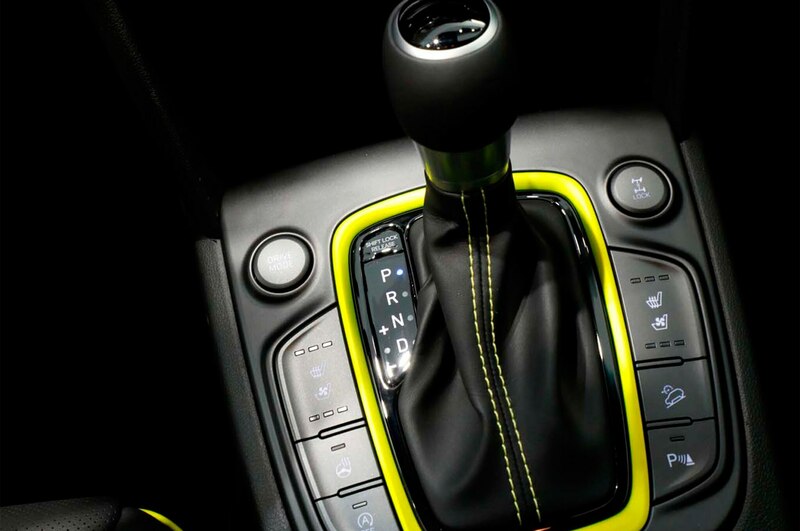 There’s a bit of hesitation at low speeds as the dual-clutch tries to find its footing, but once on the boil it’s an adept and perfectly suitable powertrain. 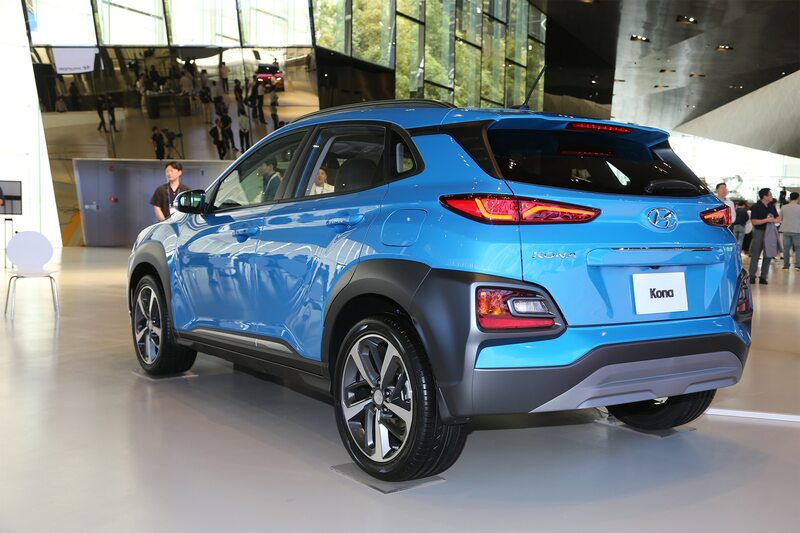 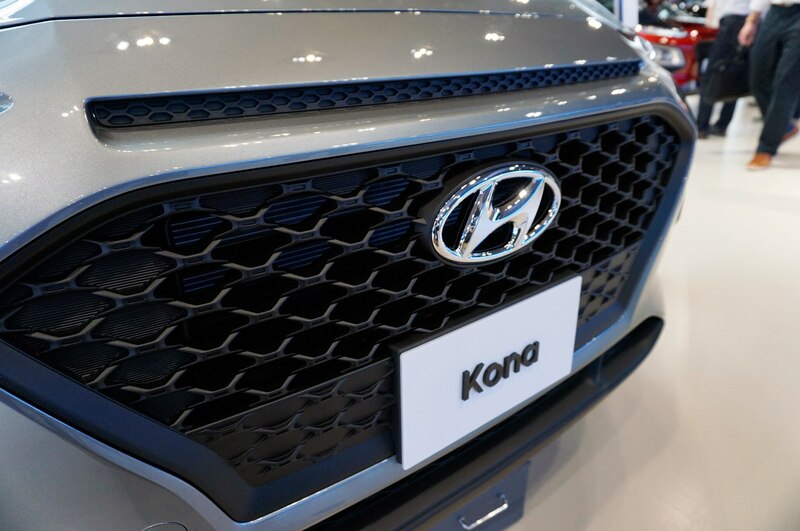 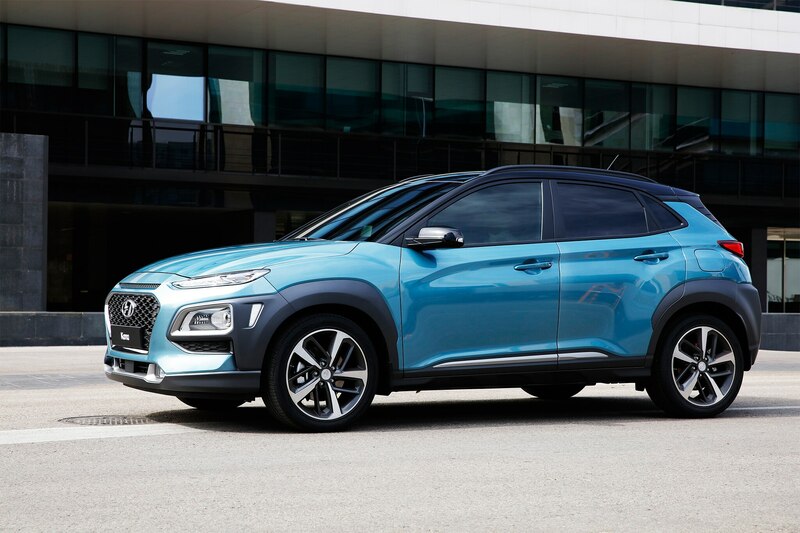 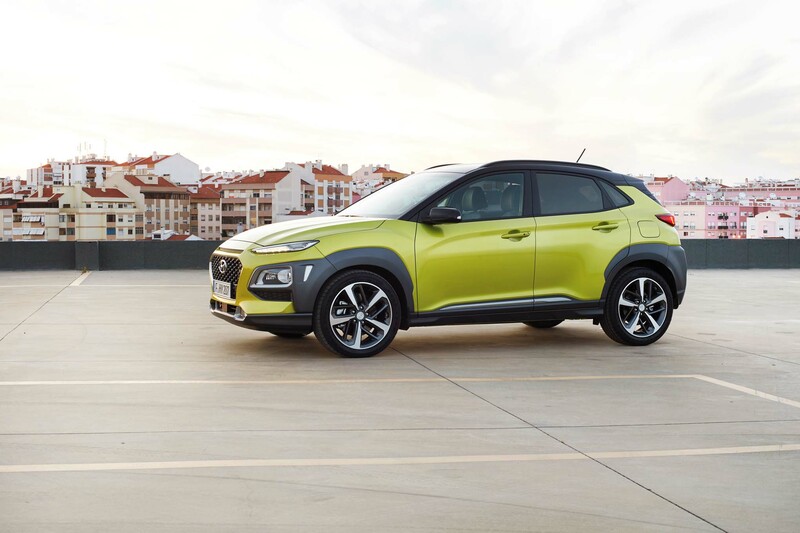 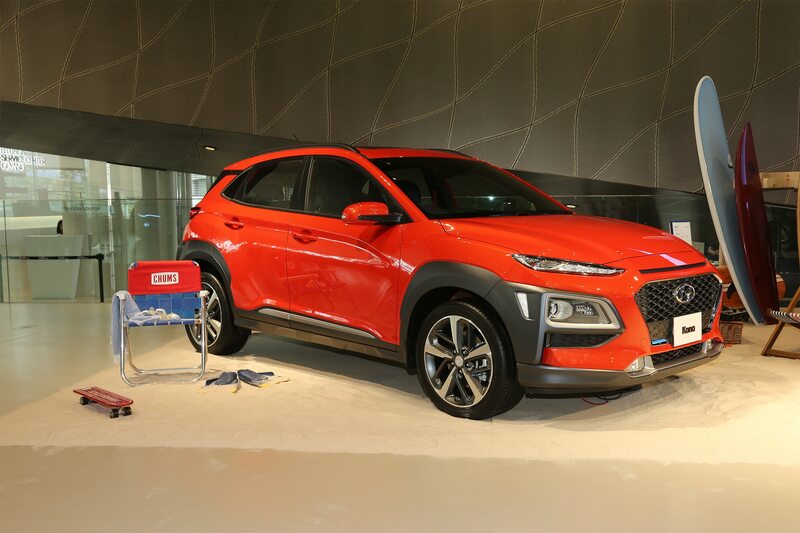 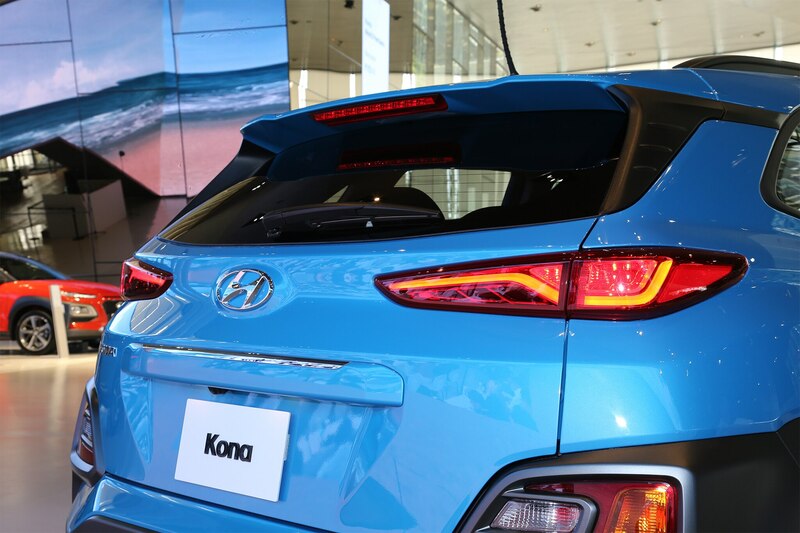 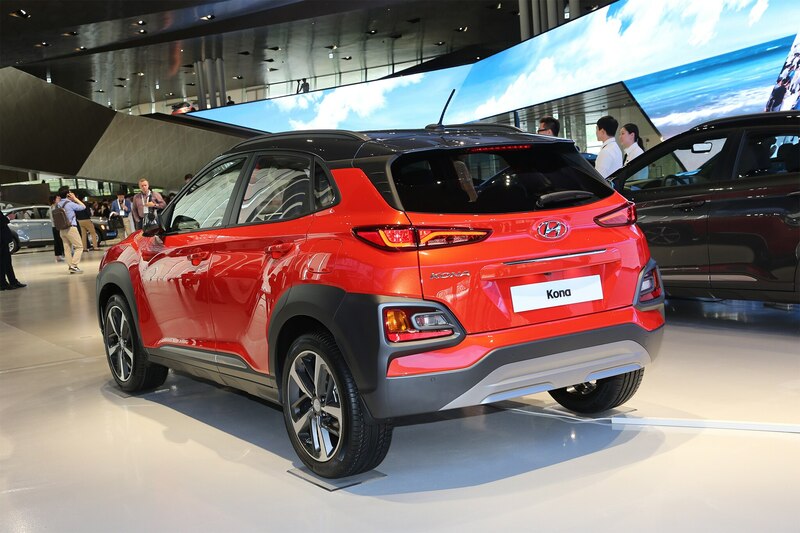 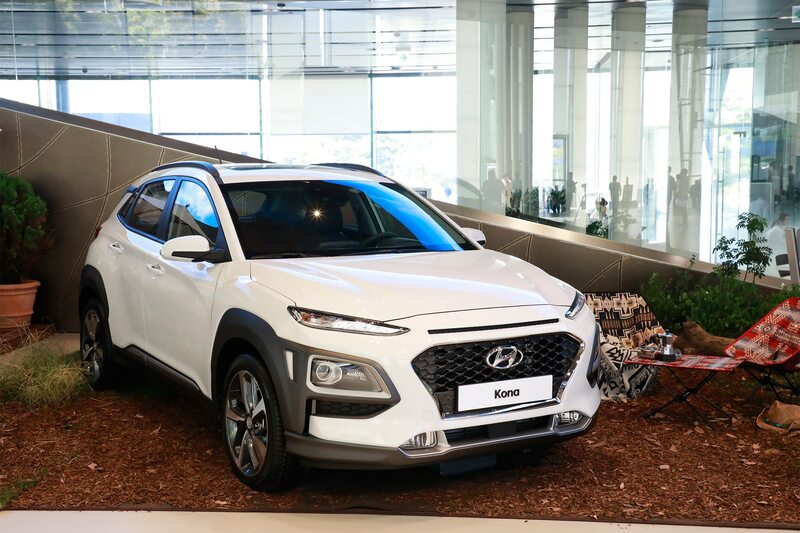 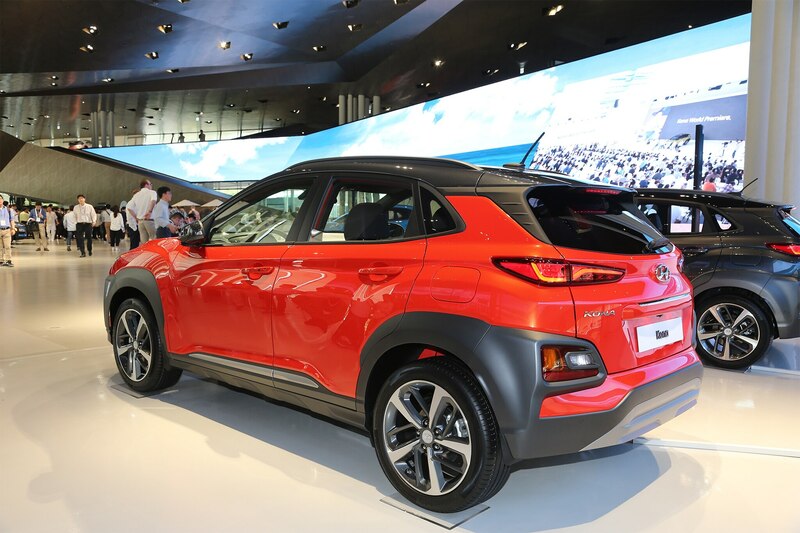 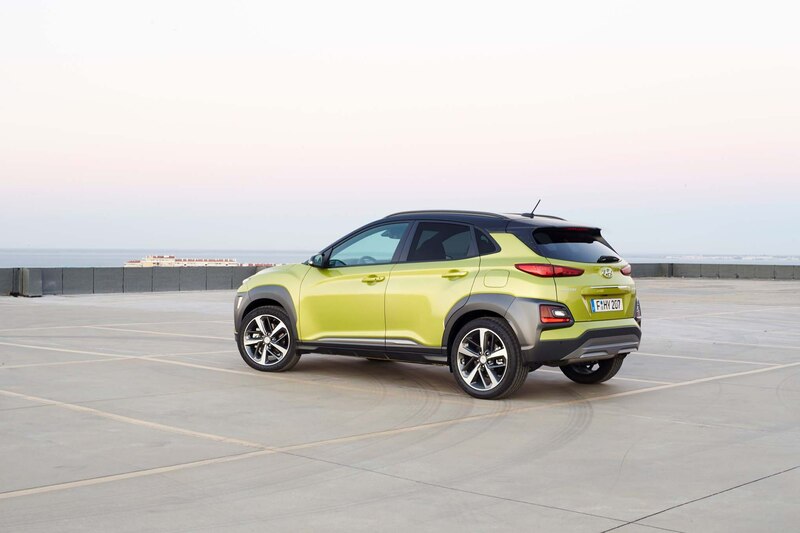 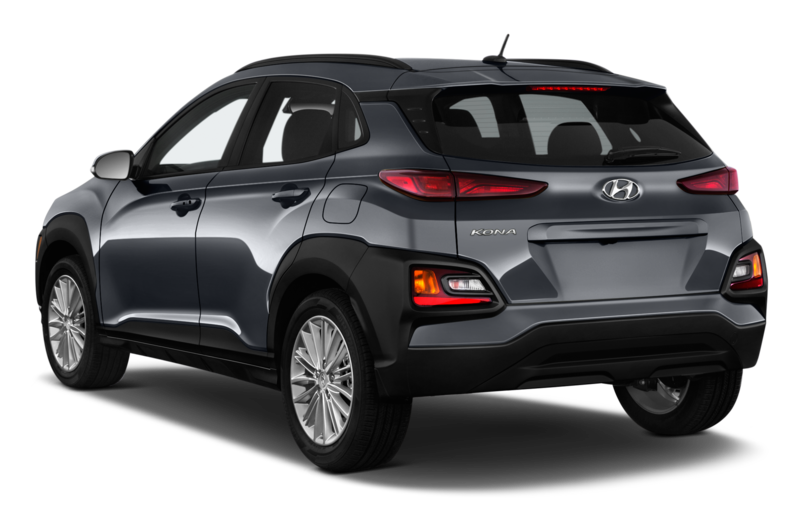 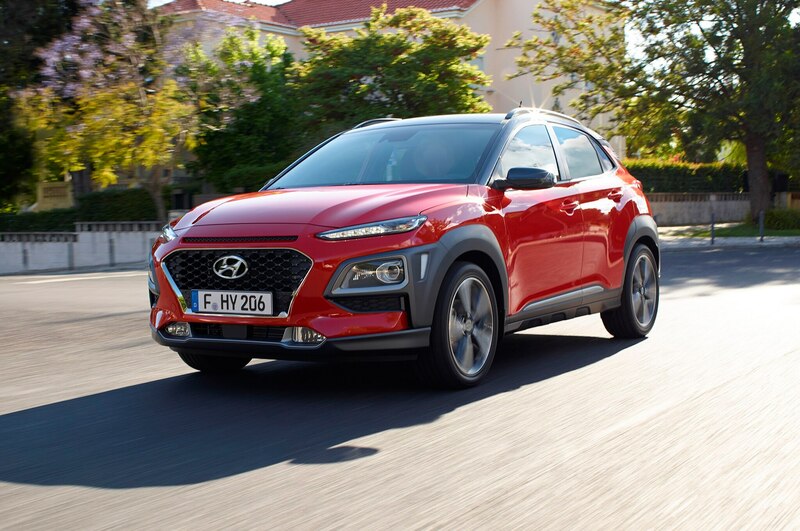 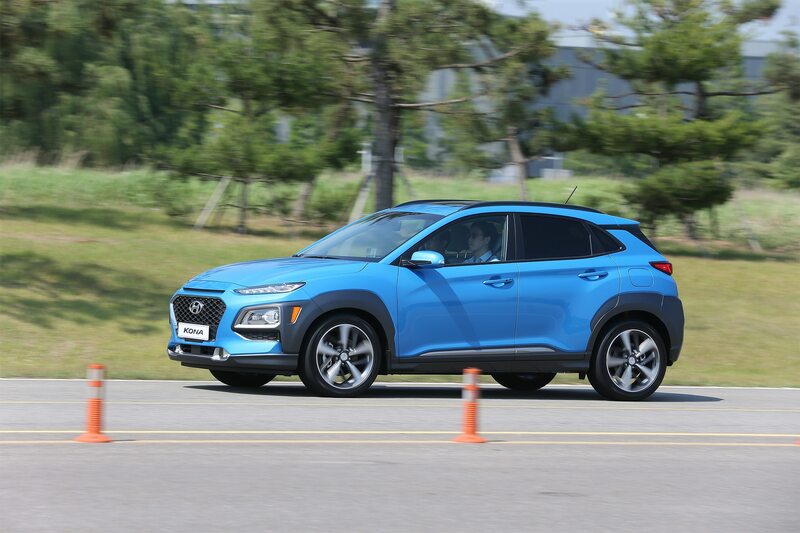 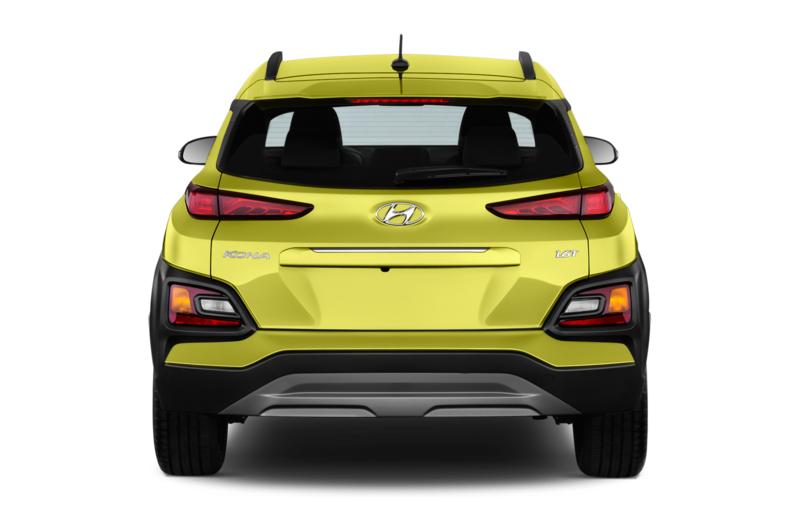 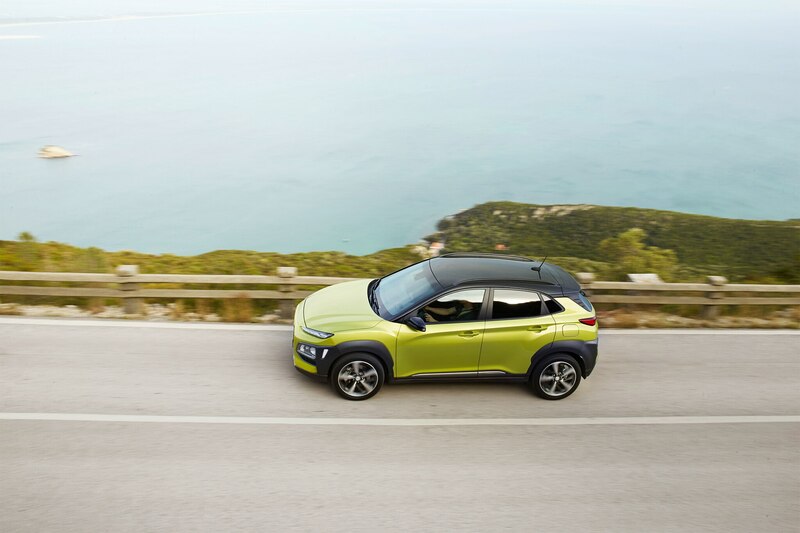 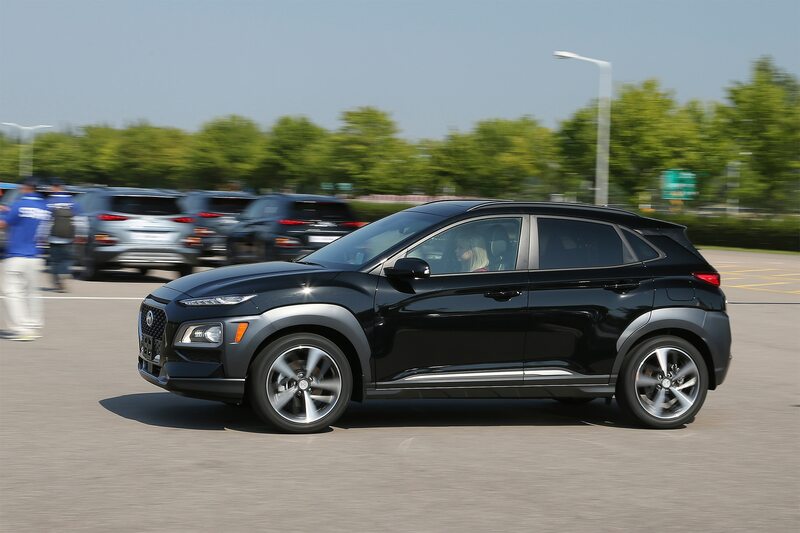 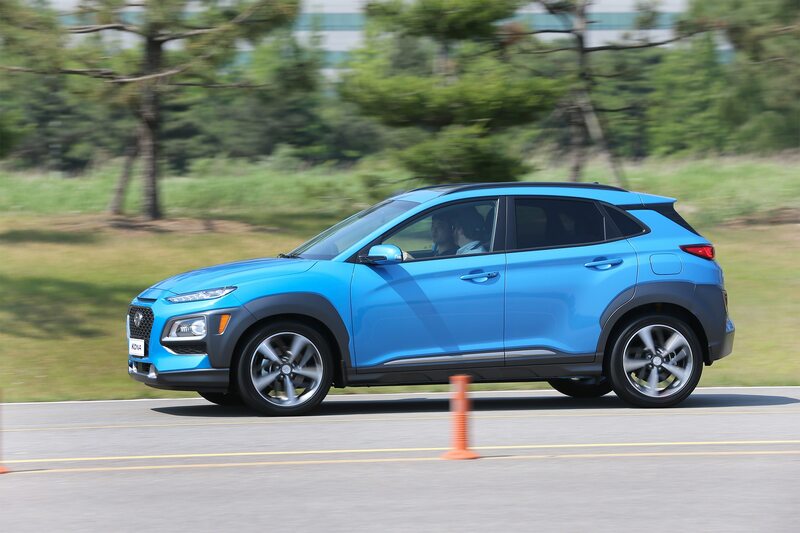 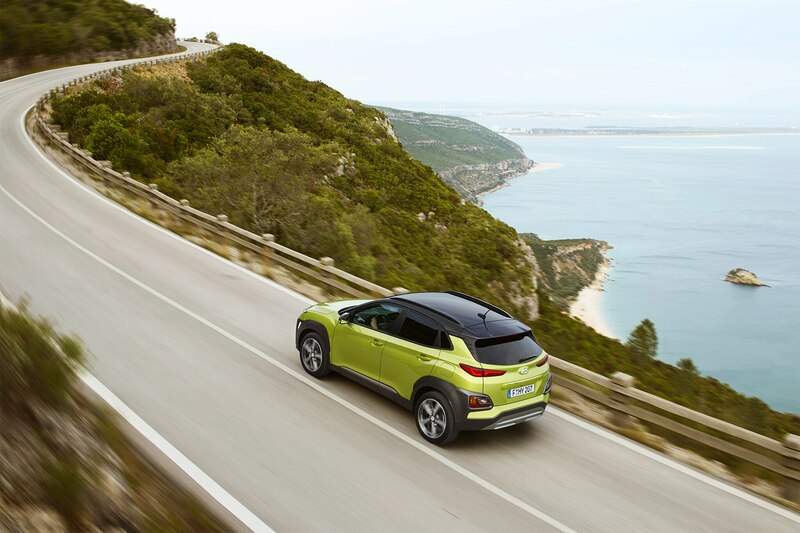 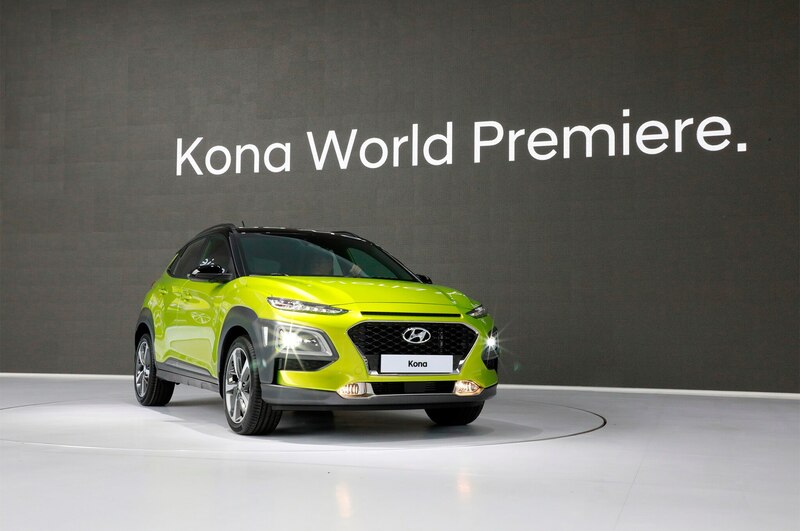 Hyundai expects 35 to 40 percent of Kona buyers will spring for the uprated engine, which will be standard on SEL and Ultimate models. 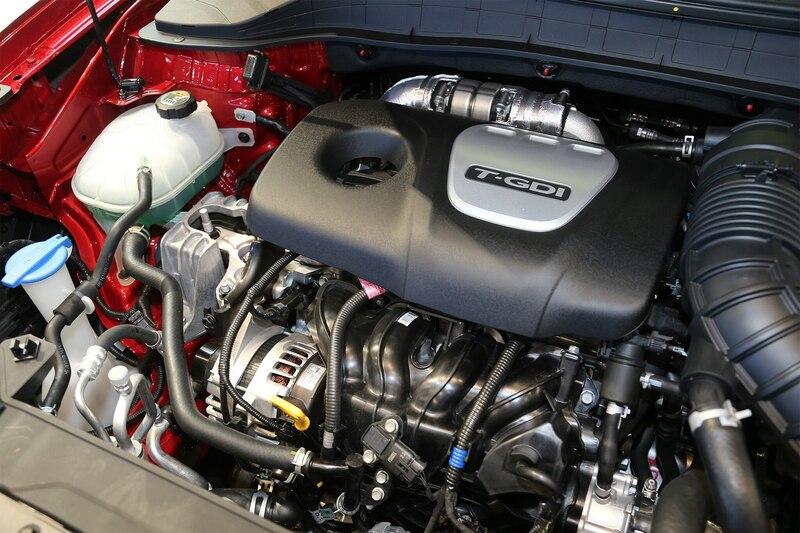 The base engine and transmission will be the sole powertrain for the lower-level SE and SEL trims. 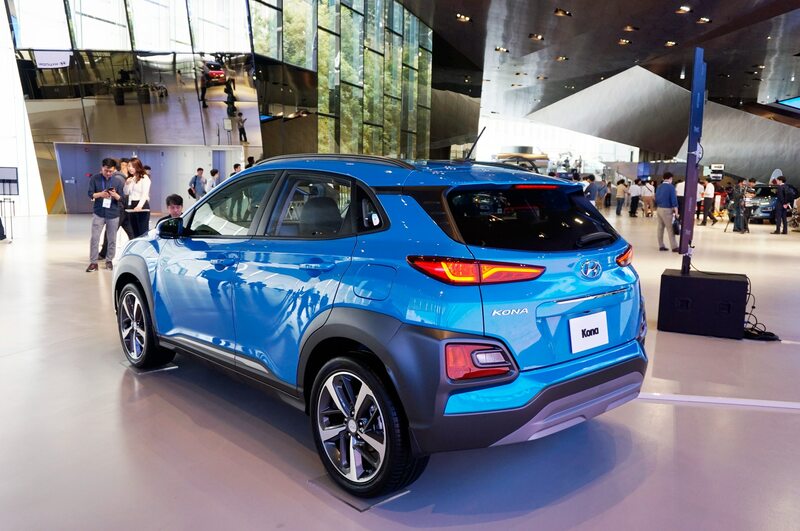 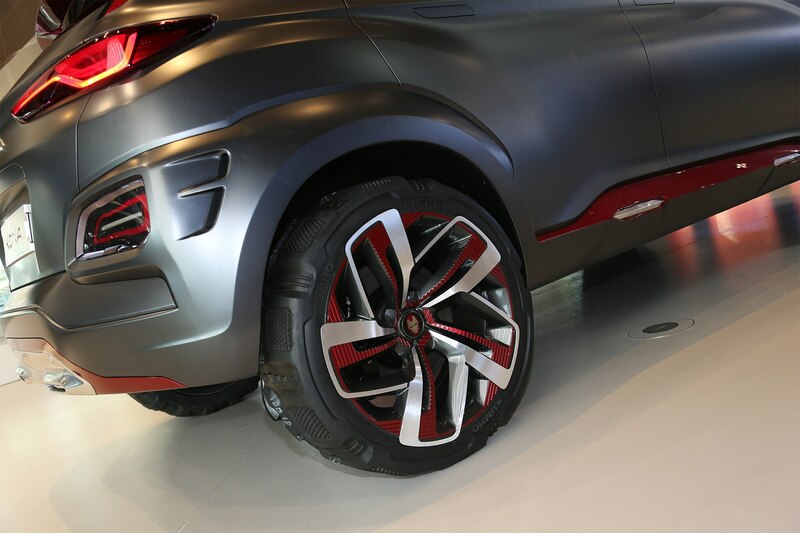 All-wheel drive will be offered as a stand-alone option on all models, and Hyundai expects about 45 percent of buyers to tick that box. 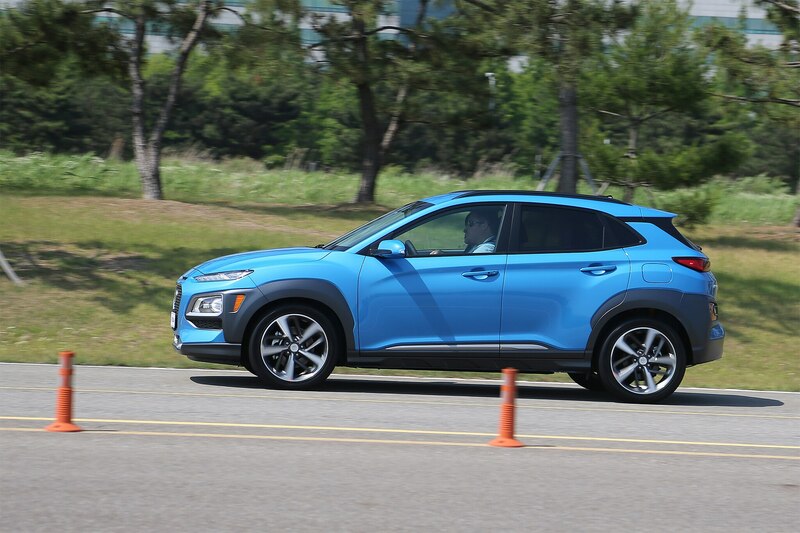 Hyundai is so far frustratingly mum on how exactly the suspension and steering will be tuned for U.S. spec models, but the Korean-spec Kona has a reasonably firm suspension and pleasant heft to the steering. 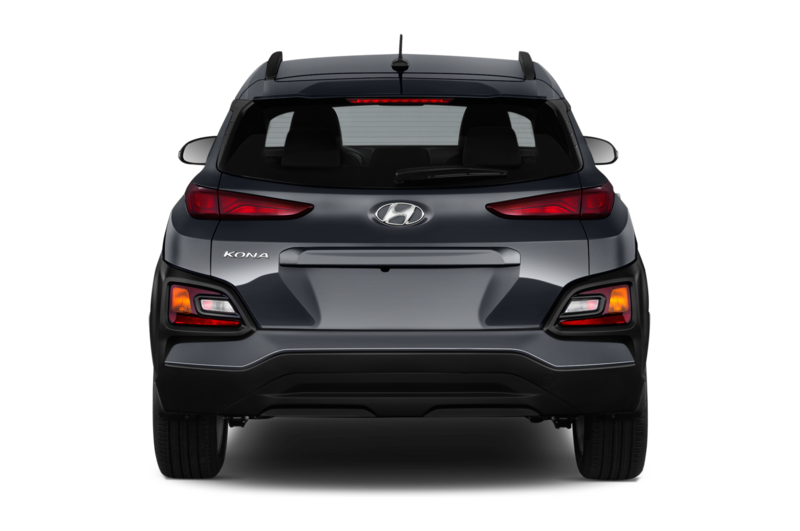 While not as sharp and responsive as the Mazda CX-3, the Kona is a far cry from the lethargic Honda HR-V, even in Normal mode. 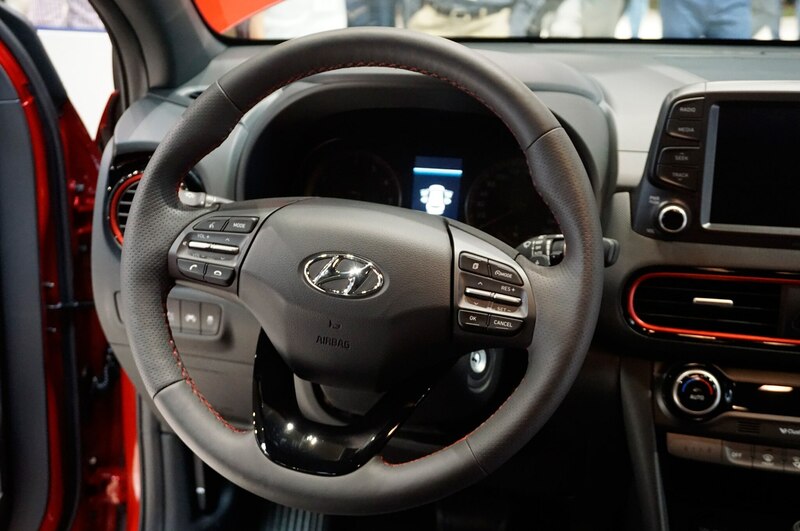 Body roll was noticeable — but not excessive — during swift navigation of several roundabouts. 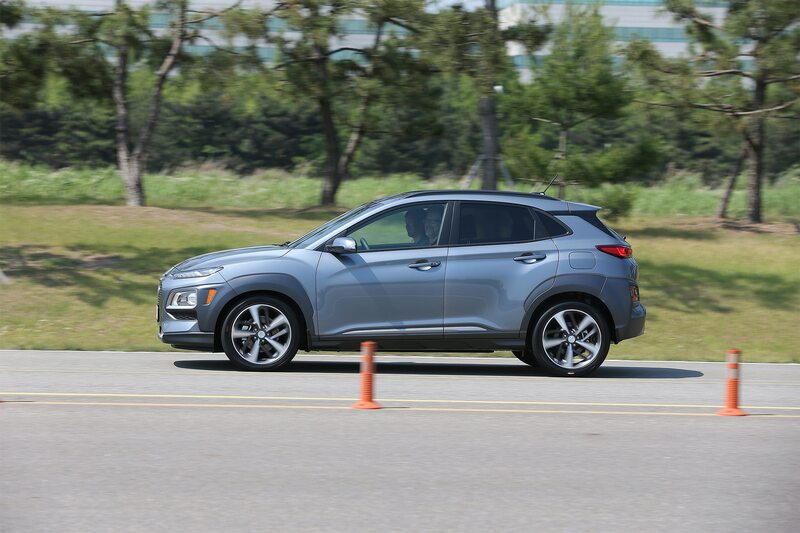 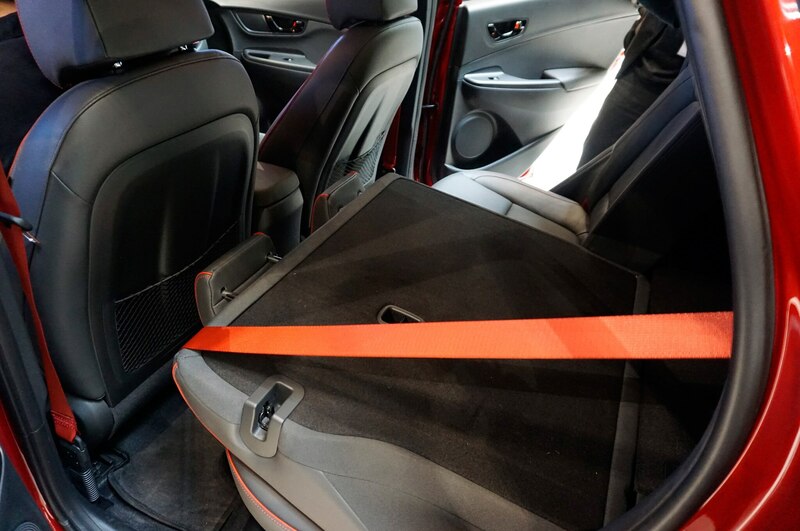 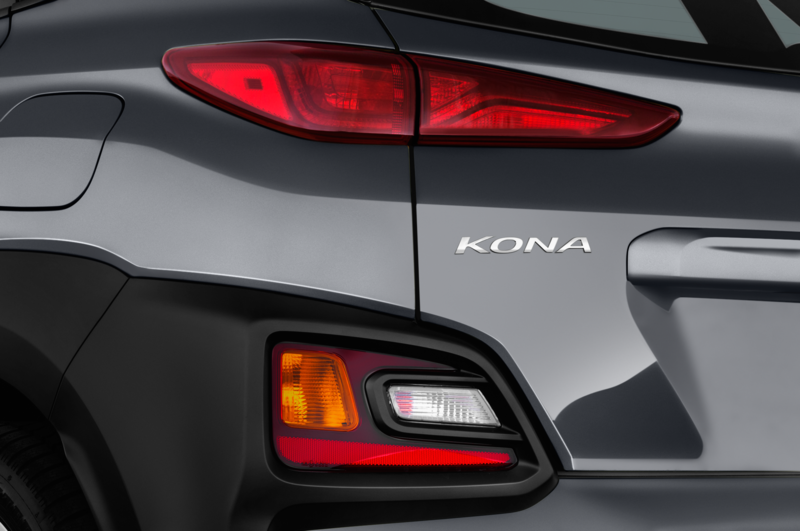 Over expansion joints and small bumps, the Kona shows off very solid body control and compliance, although Hyundai’s handling course is a world away from some of America’s more decrepit roads. 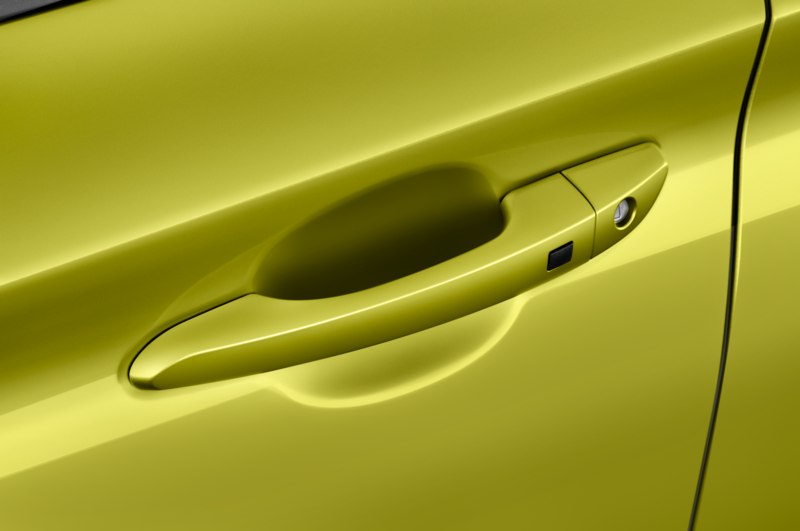 (Engineered imperfection just isn’t the same as good ol’ fashioned neglect and poor infrastructure management.) 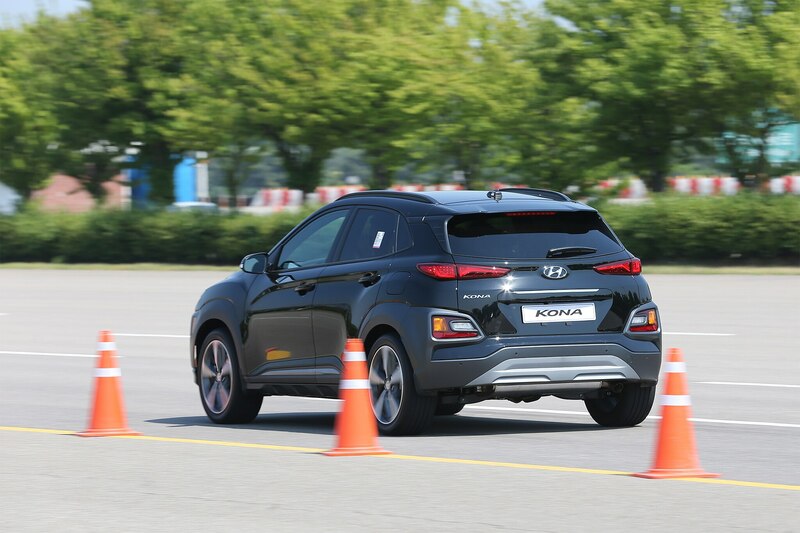 Our test car was equipped with all-wheel drive, meaning it featured a multi-link rear suspension in place of the front-wheel-drive version’s torsion-beam setup. 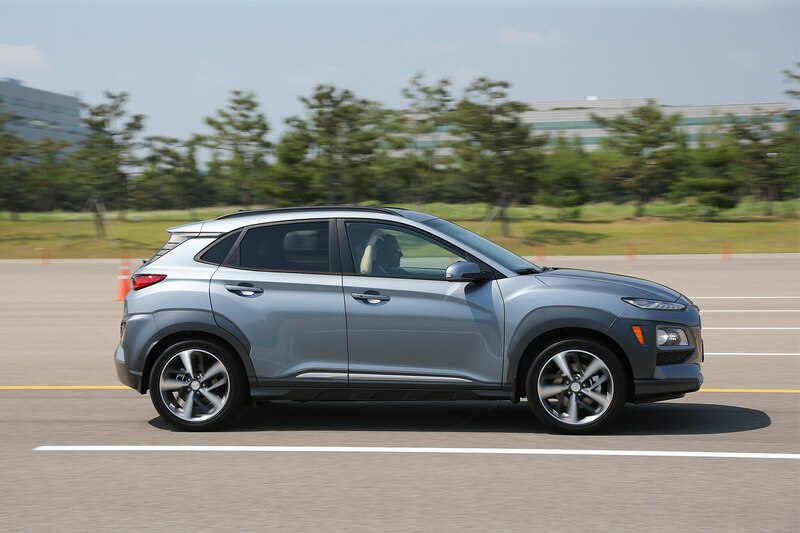 Dynamics are, however, not the biggest attraction for subcompact crossover shoppers. 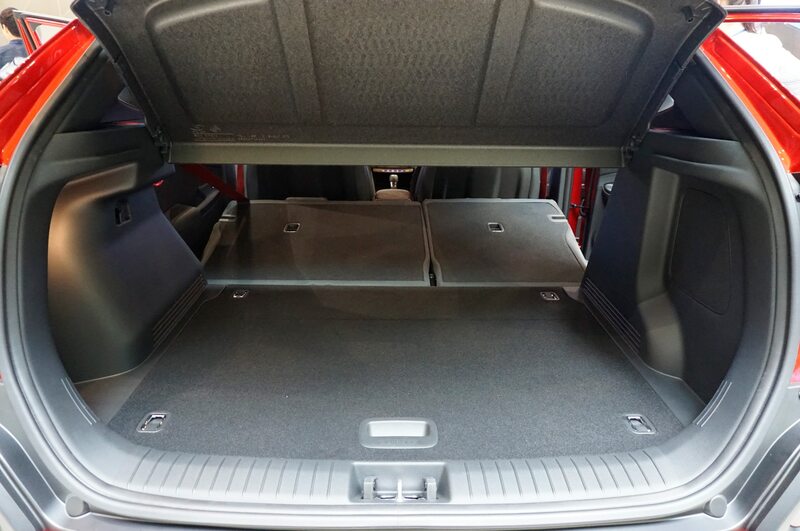 Those would be style, equipment, and space. 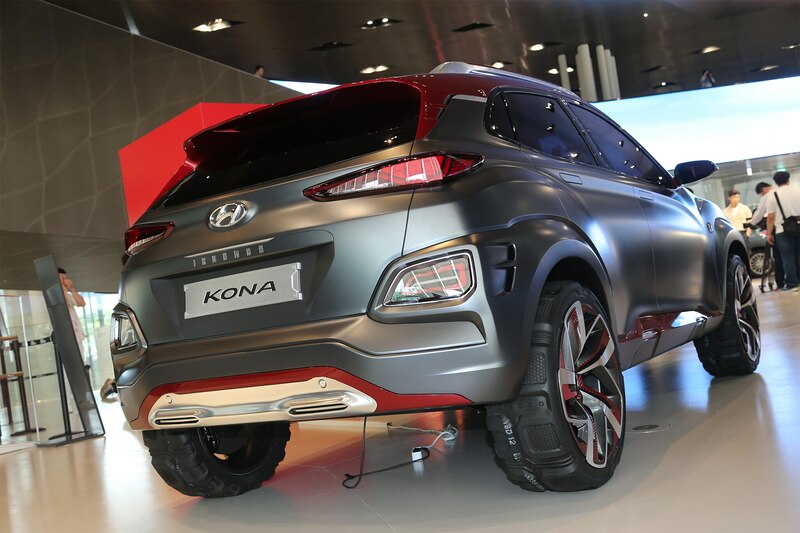 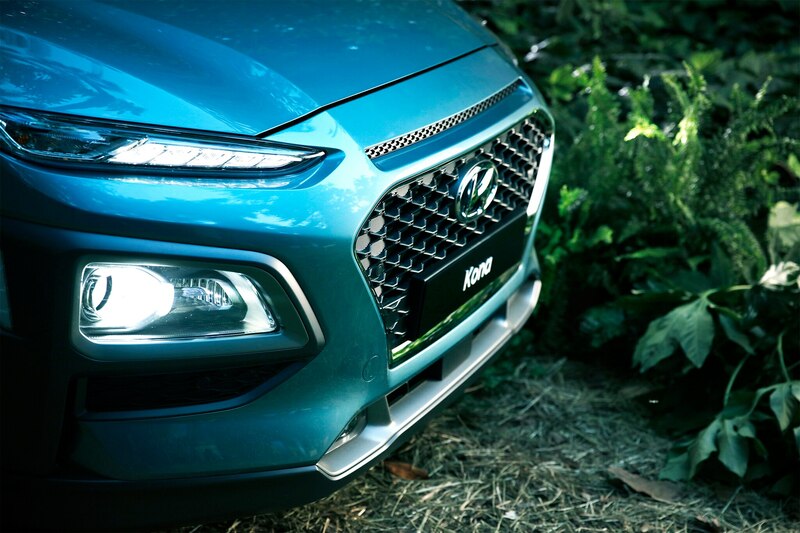 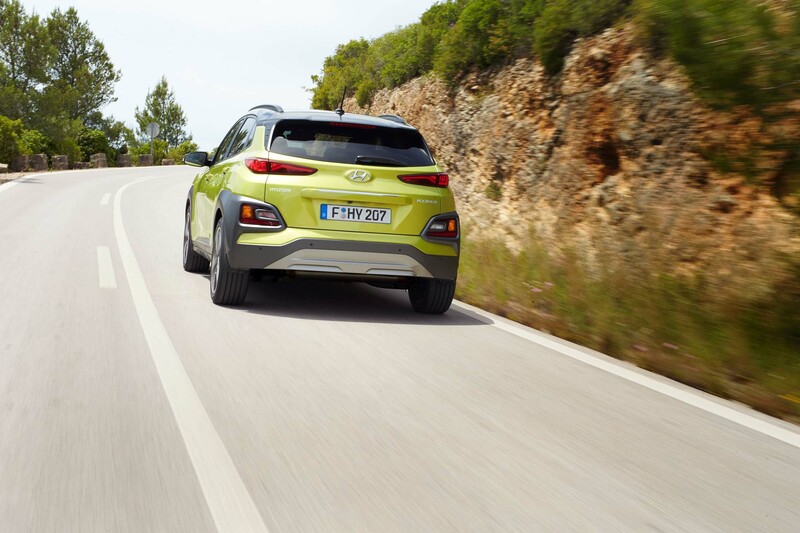 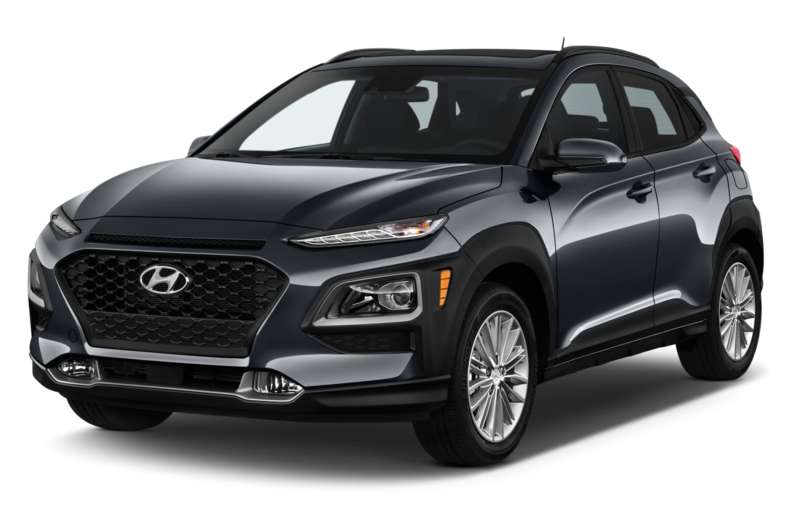 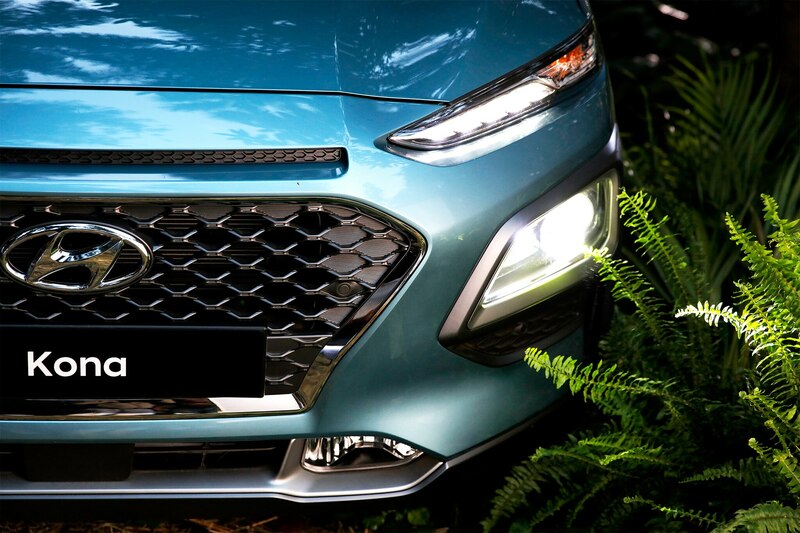 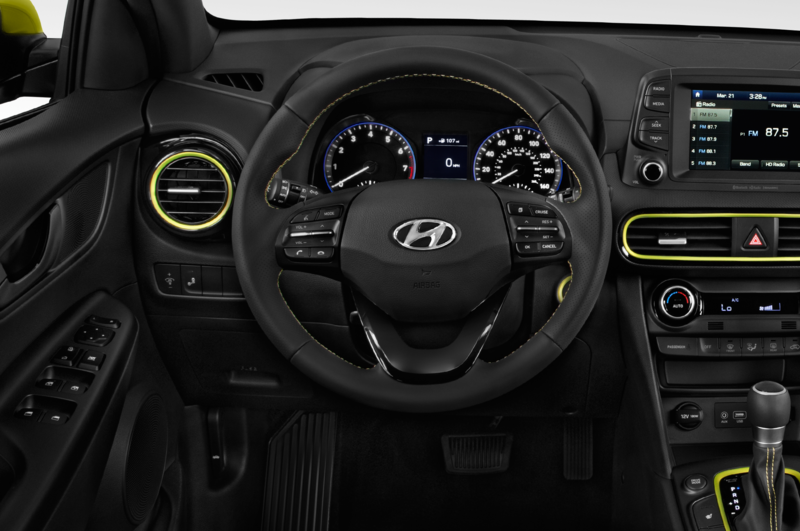 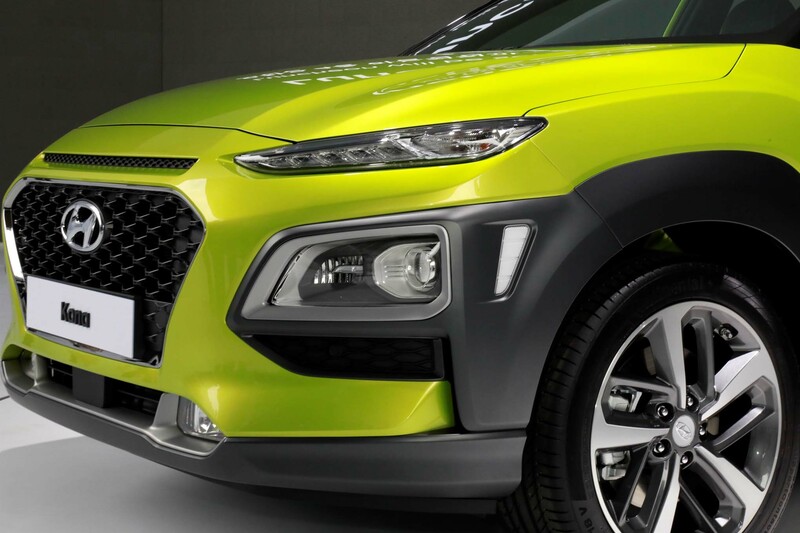 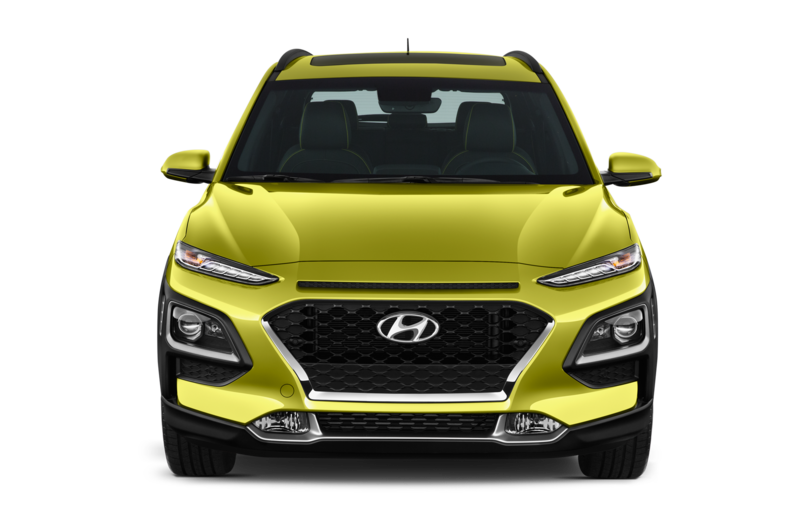 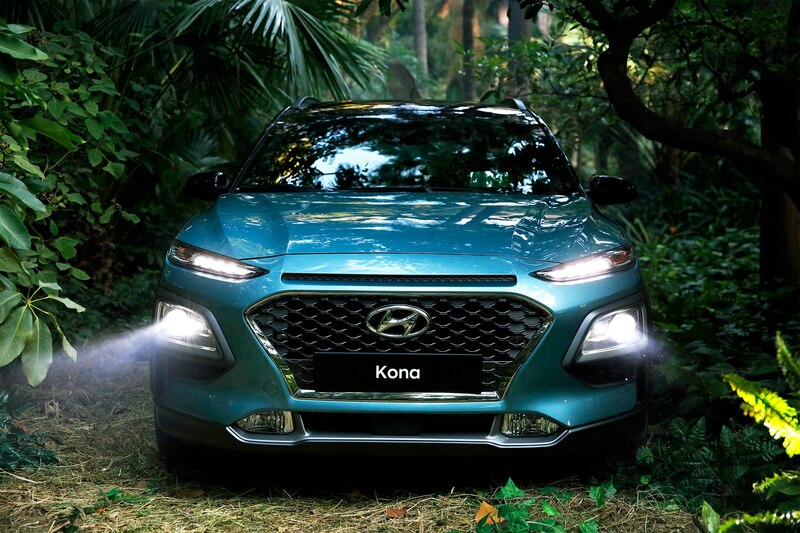 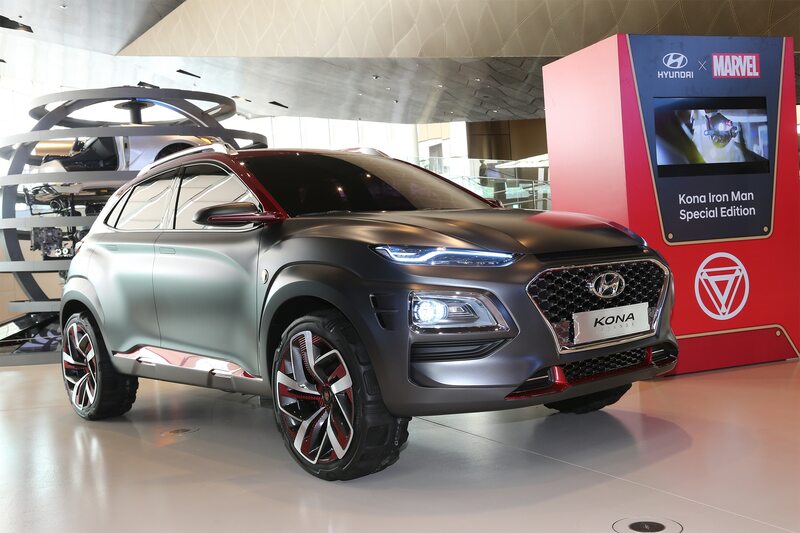 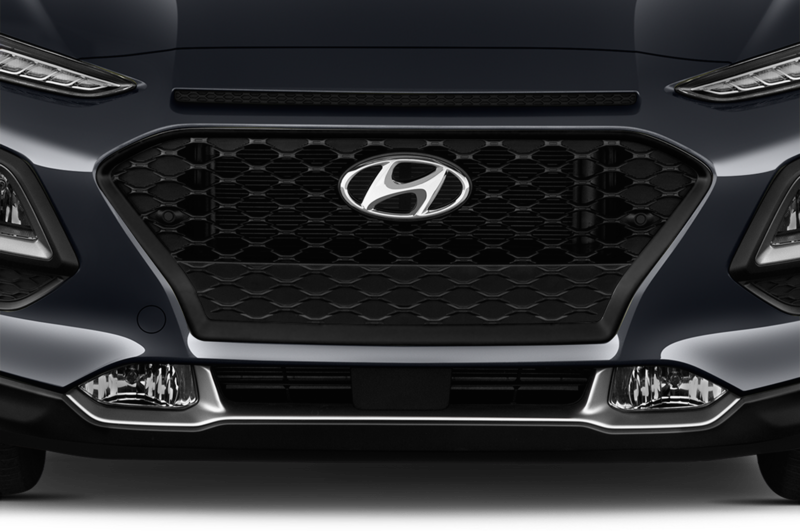 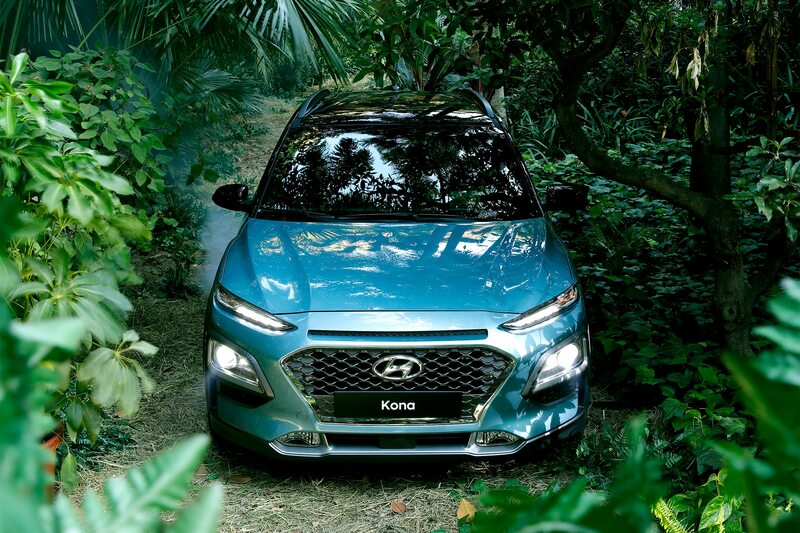 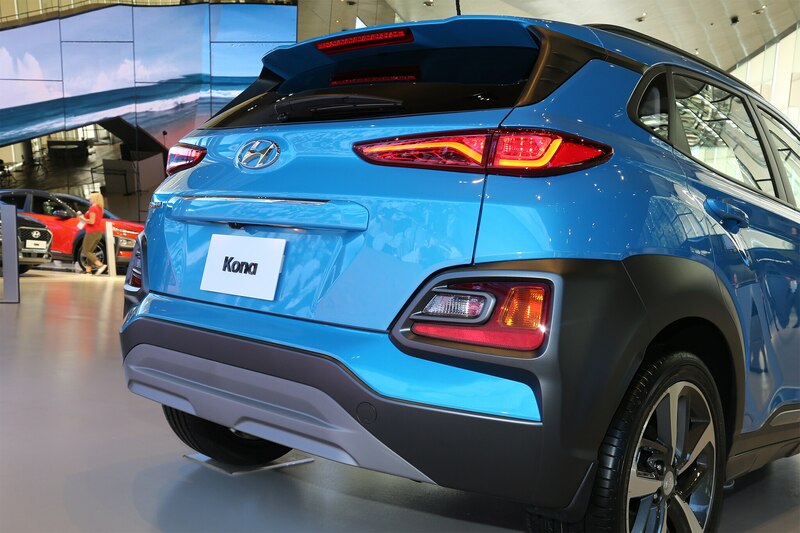 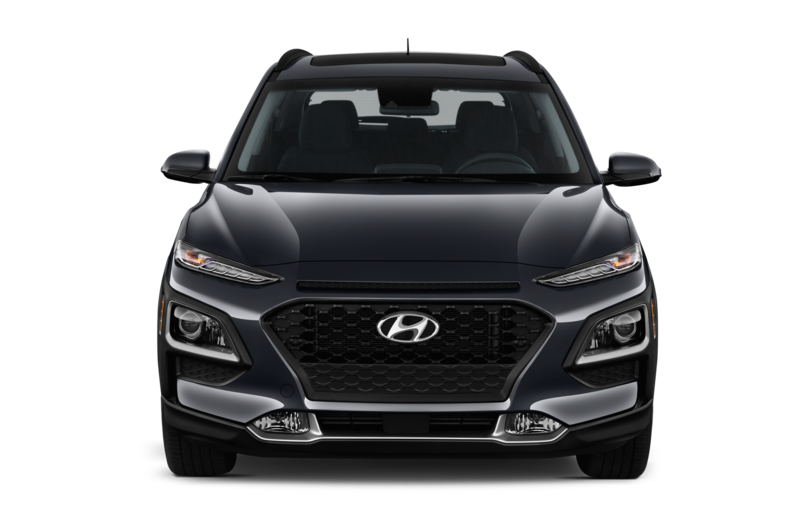 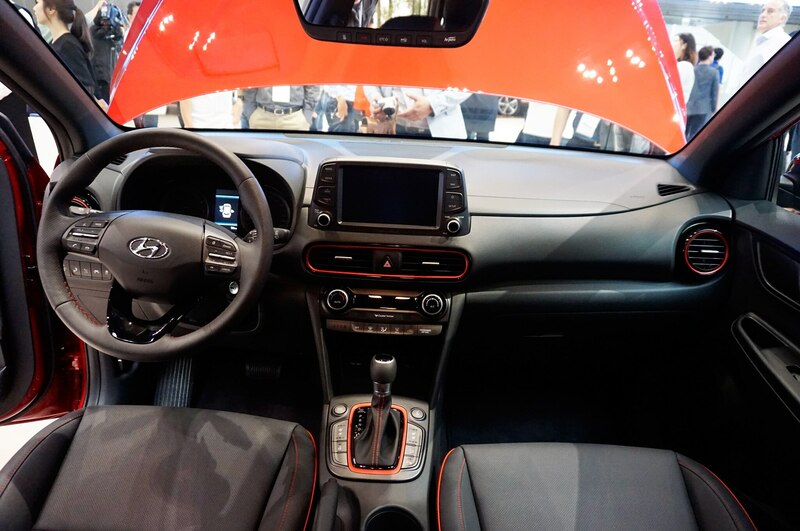 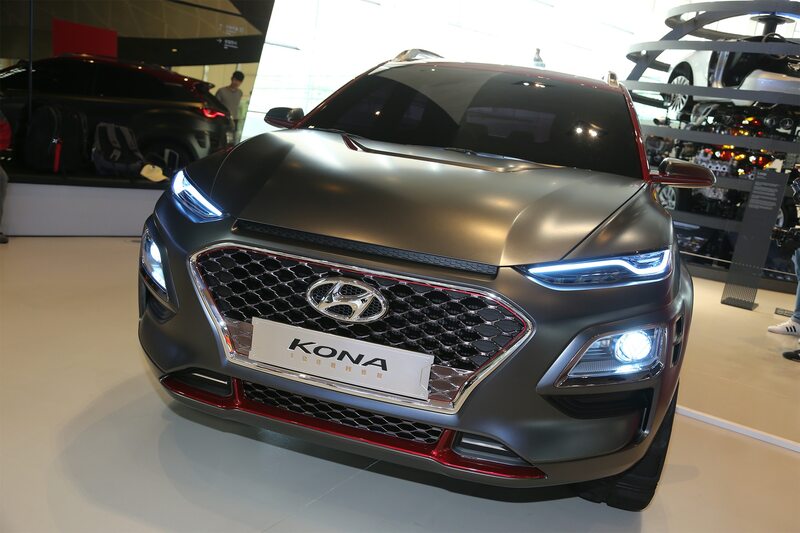 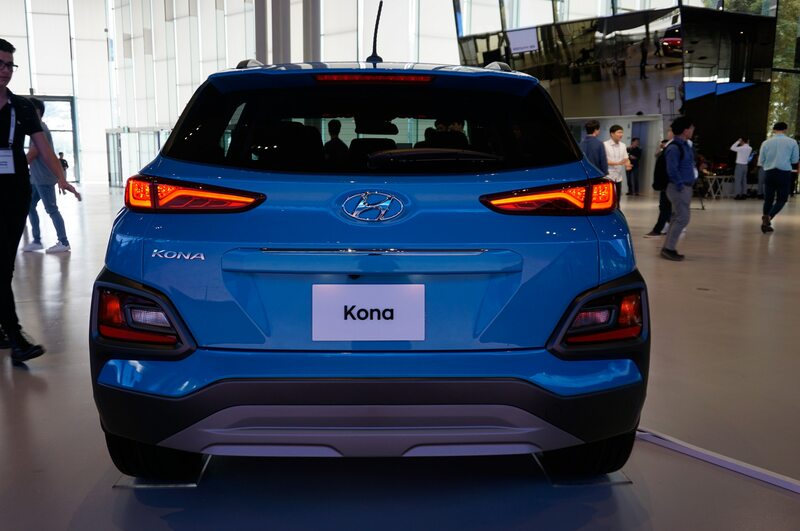 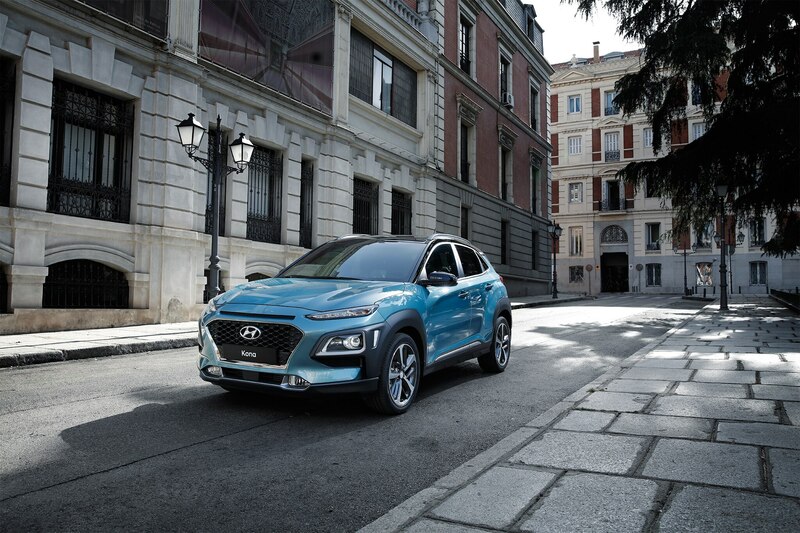 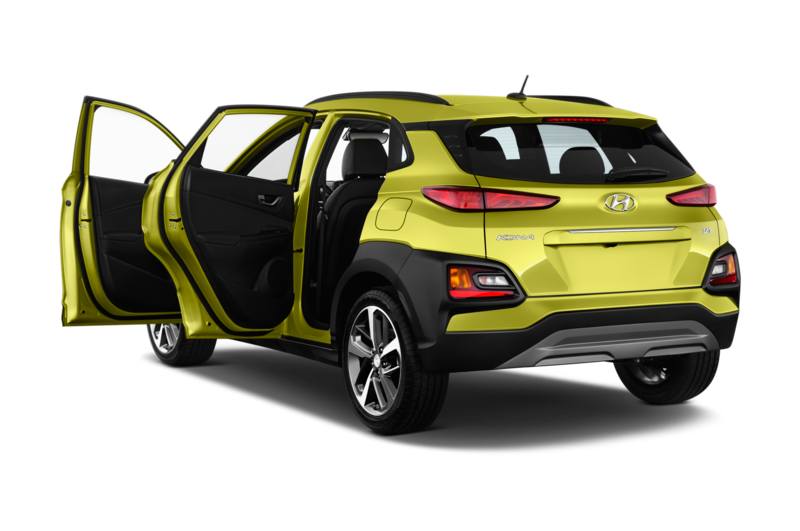 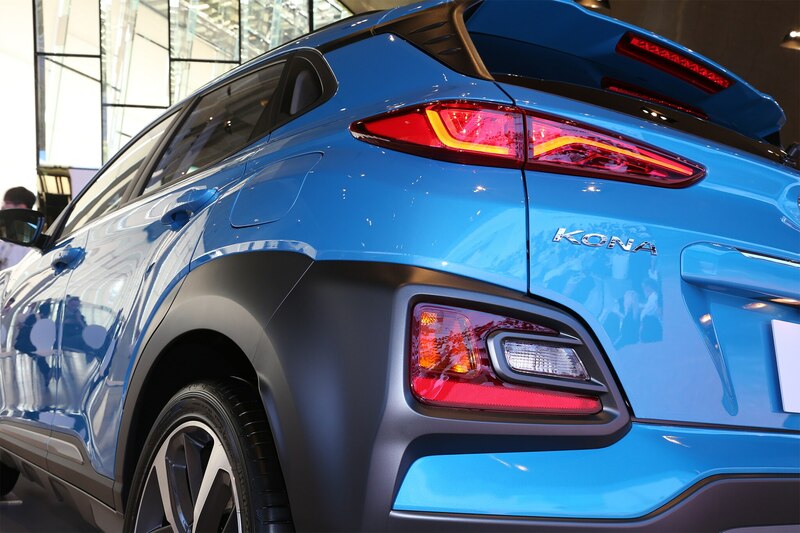 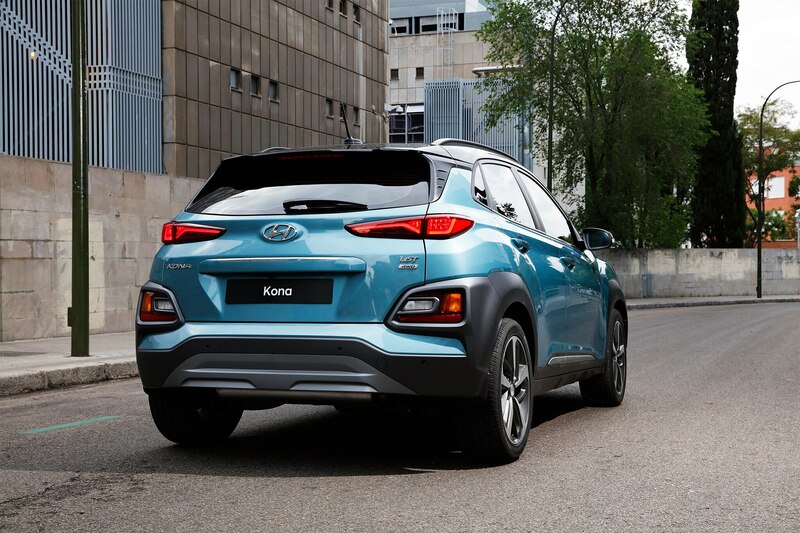 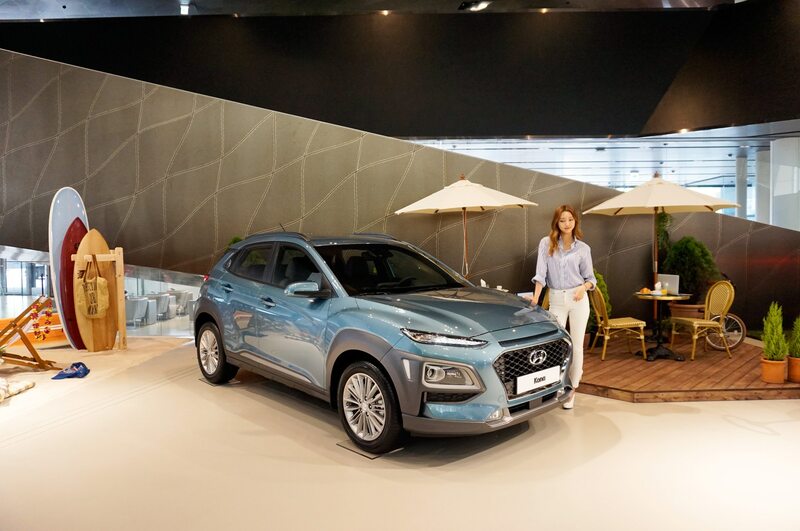 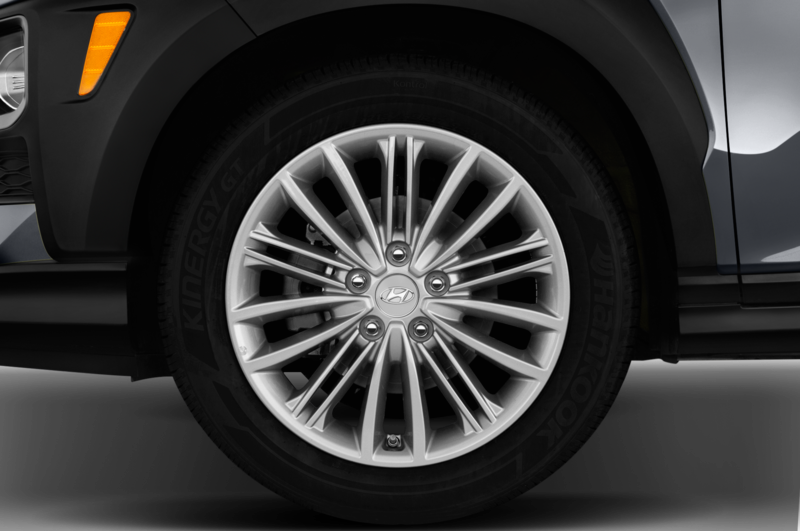 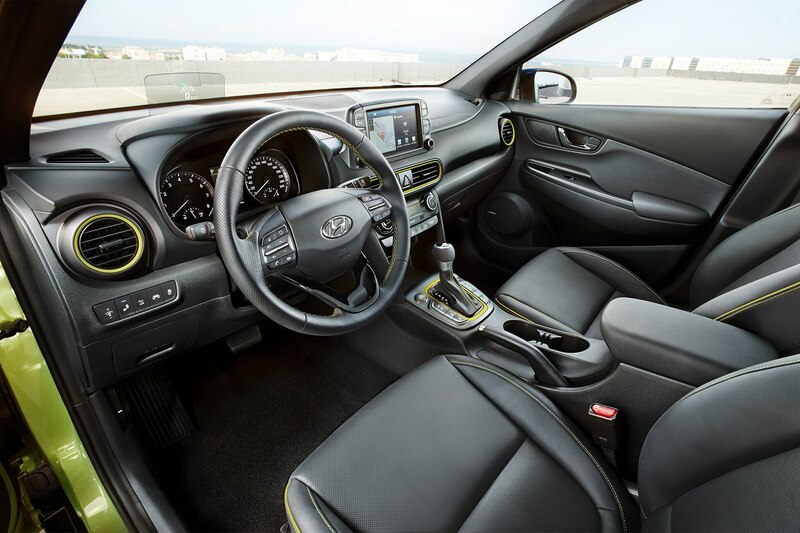 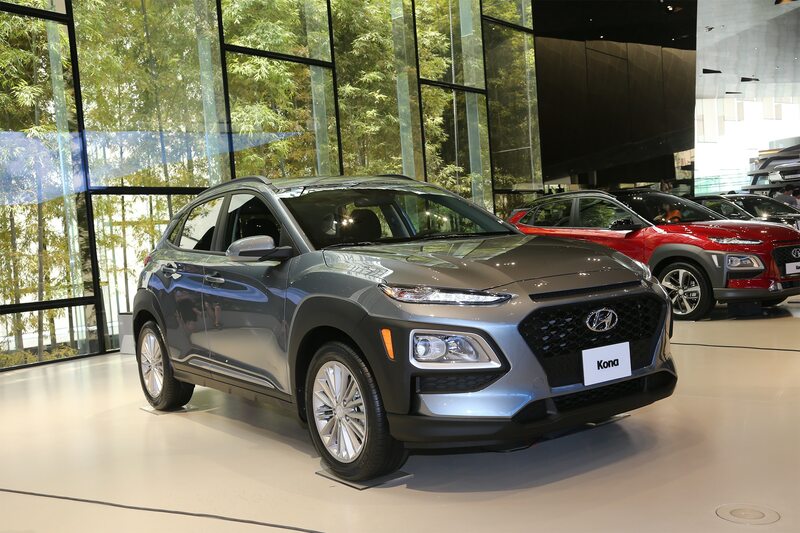 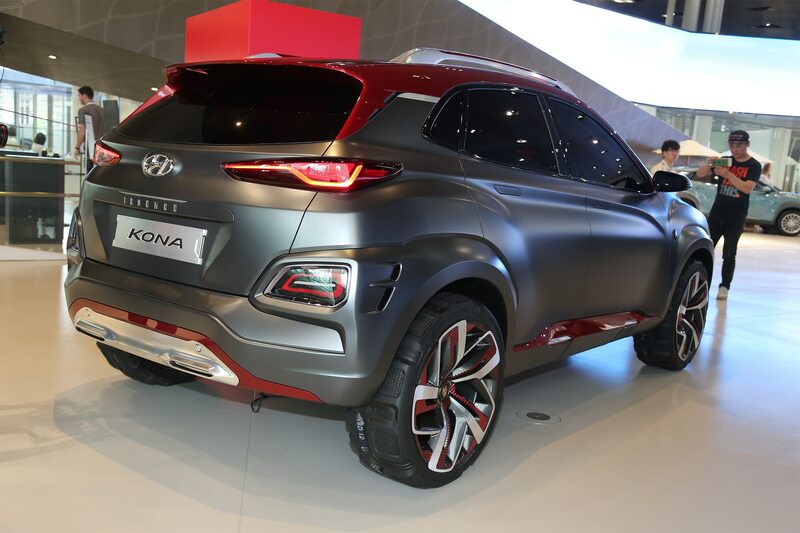 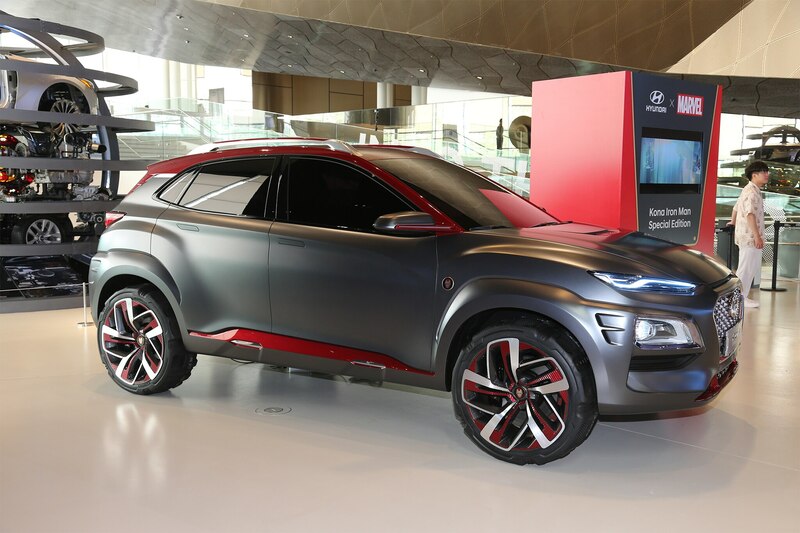 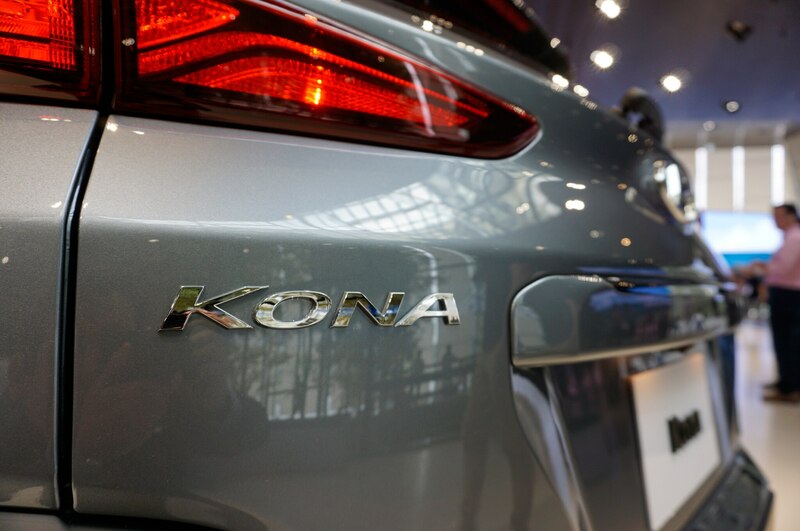 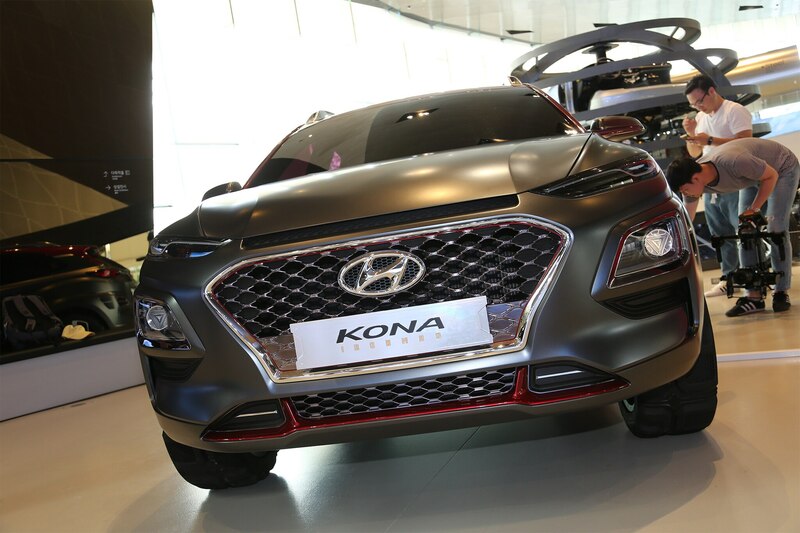 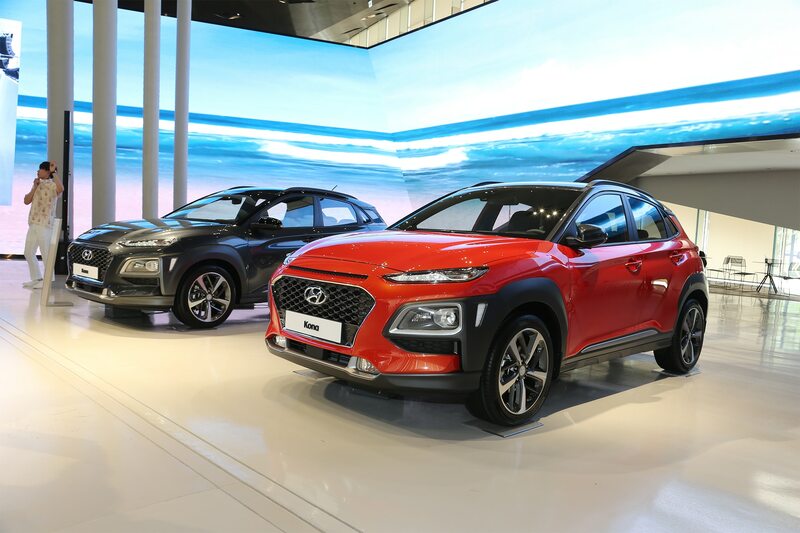 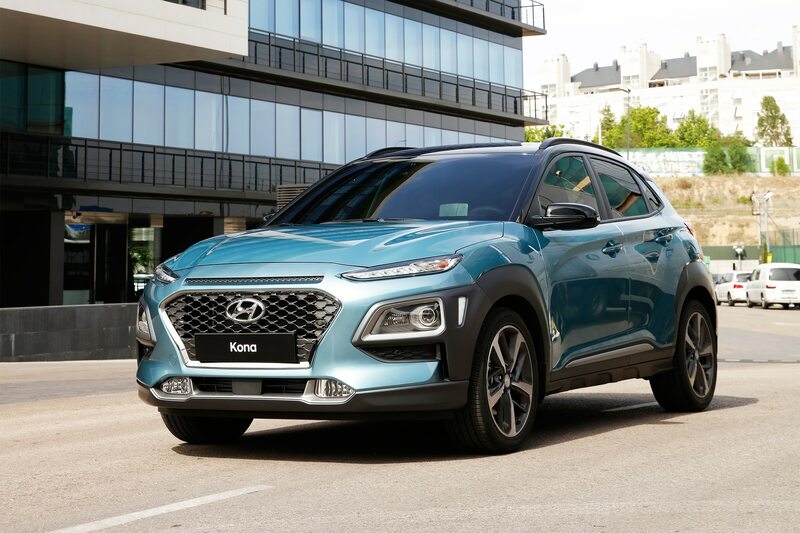 The Kona’s design, led by a veteran cohort including chief Peter Schreyer, Sangyup Lee, and Luc Donckerwolke, is distinctive enough to appeal to those looking for something fresh and signals a more extroverted direction for Hyundai. 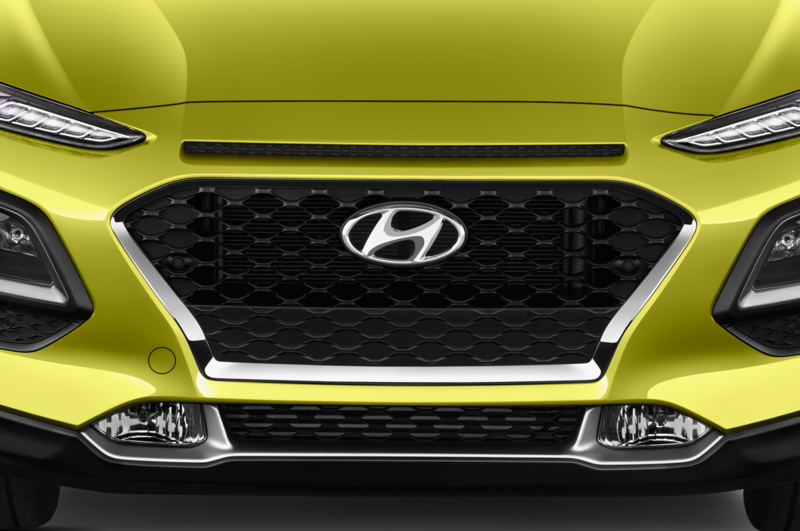 It could very well be too busy and incoherent for some, though, particularly the scrunch-faced front end. 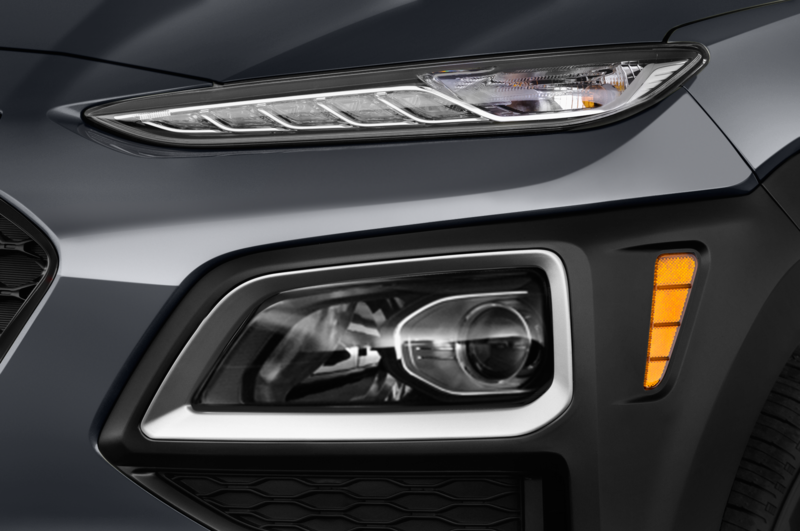 From the Jeep Cherokee-like eyelid-style day time running lamps to the faux air scoop, loads of “armor” cladding all over, and Land Rover-ish D-pillar kink, there’s a lot to digest. 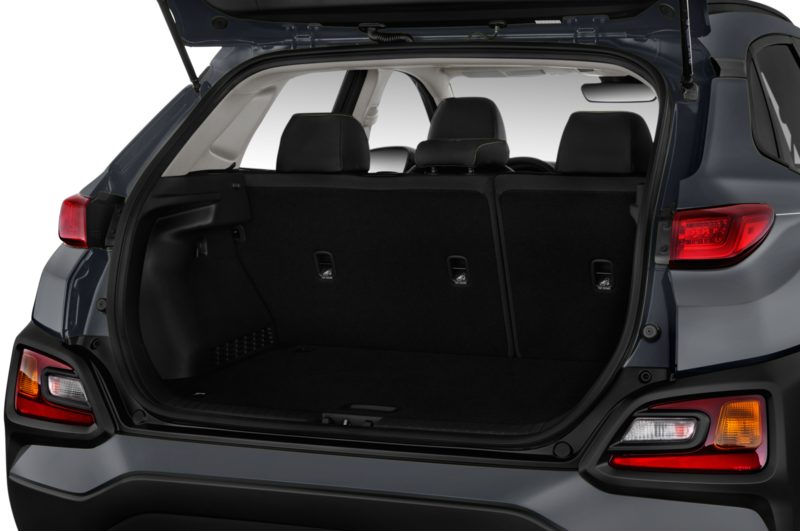 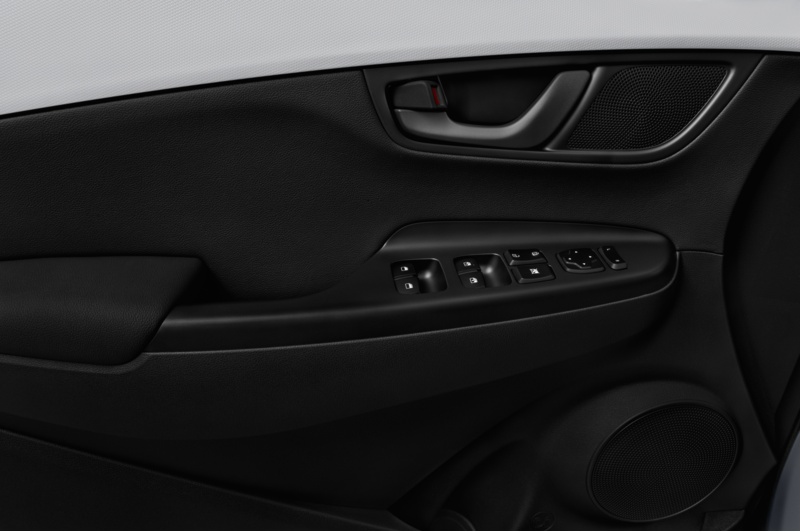 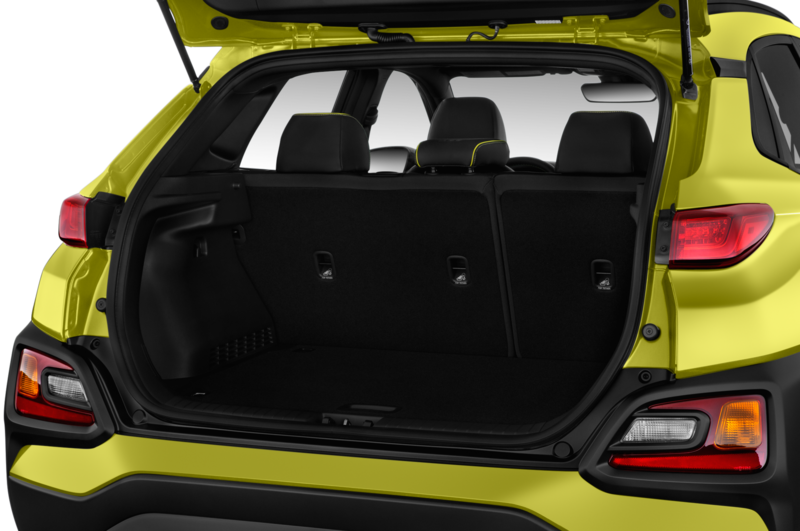 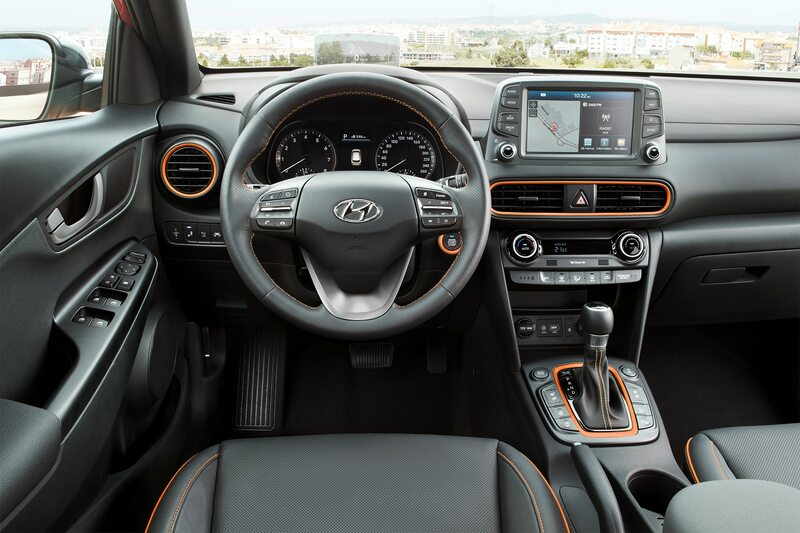 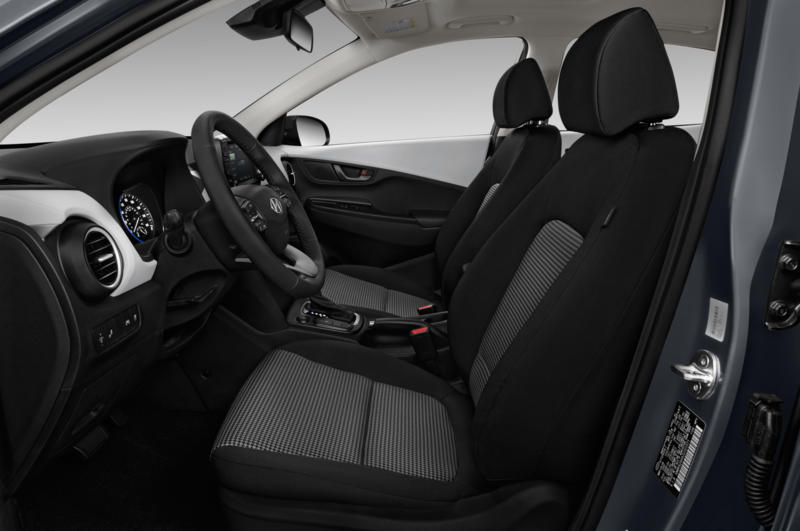 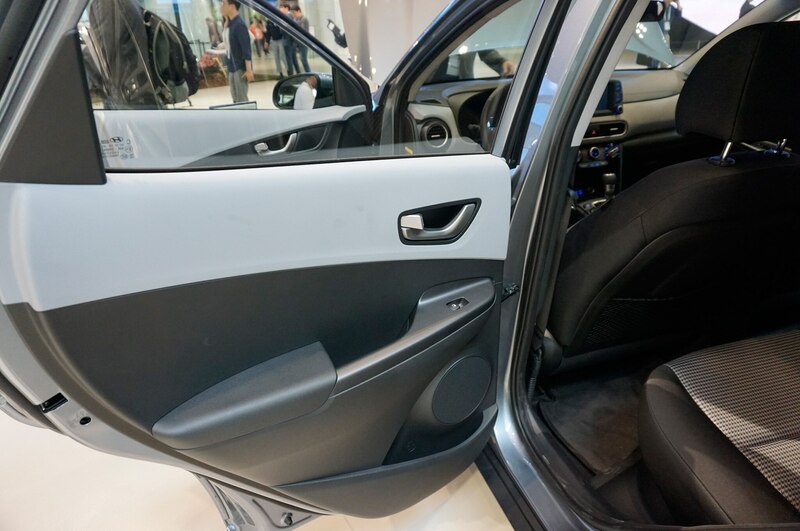 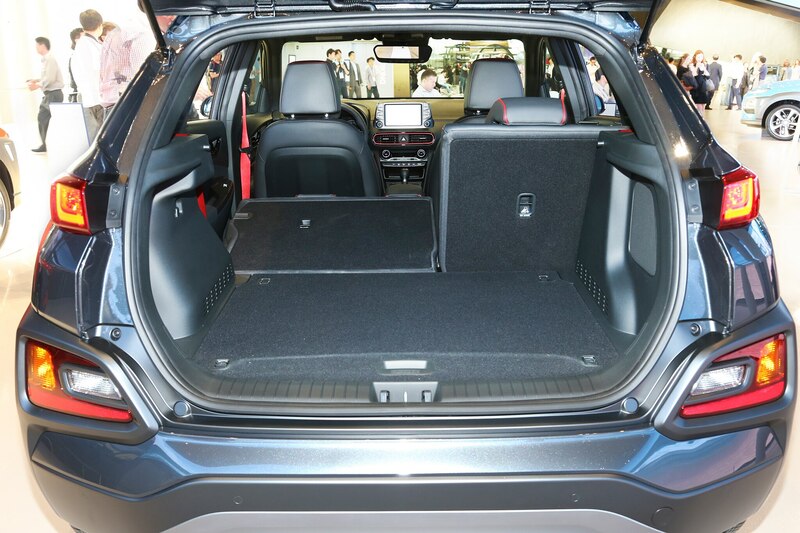 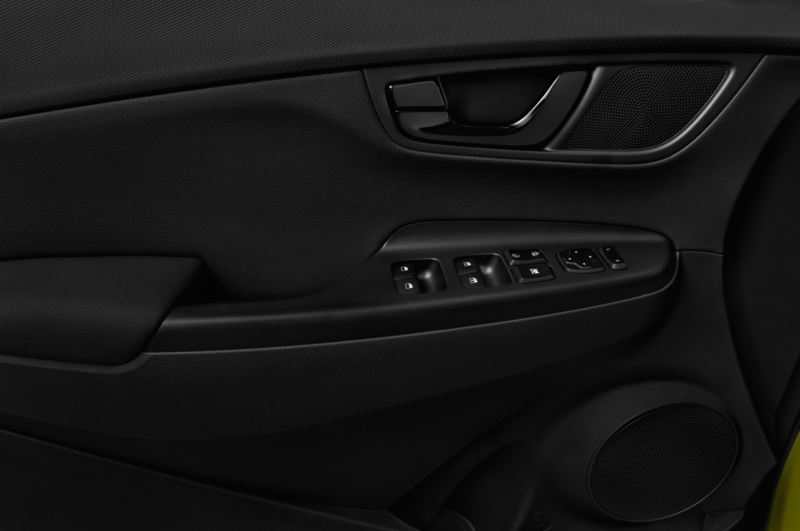 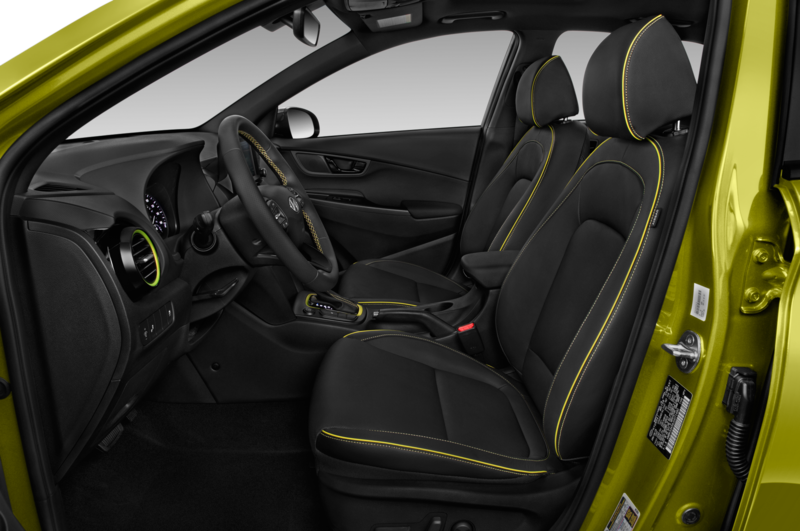 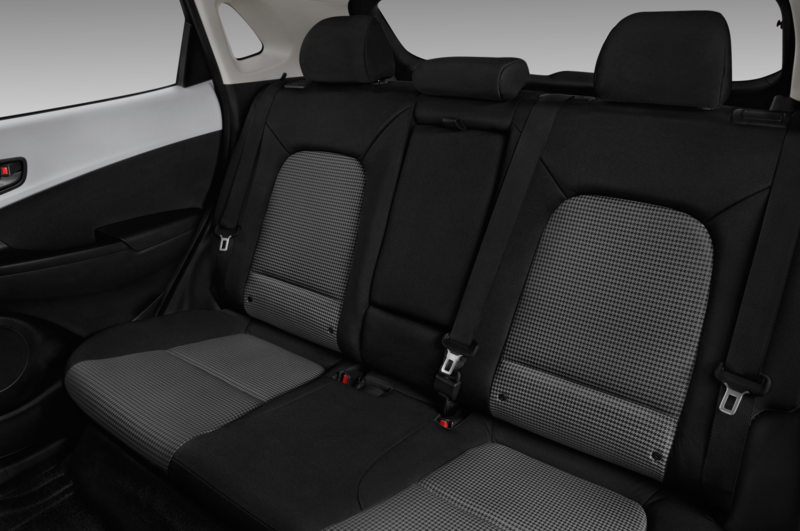 Fortunately the interior is considerably more restrained with its focus on space efficiency and intuitive functionality. 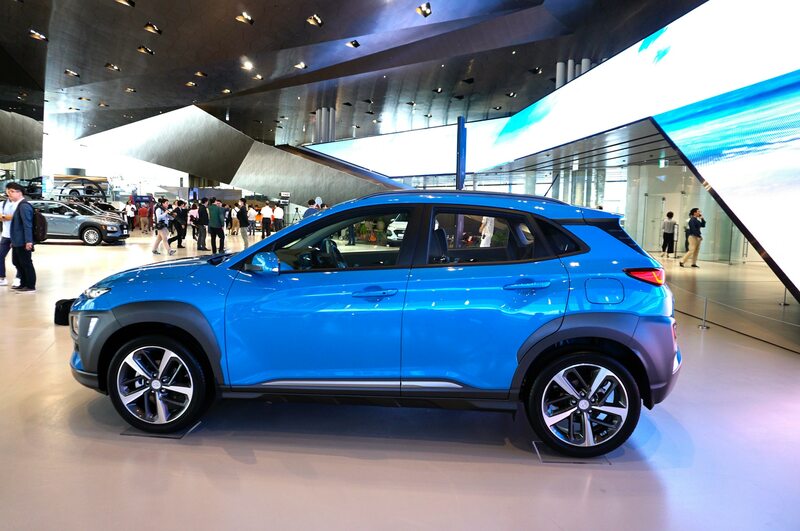 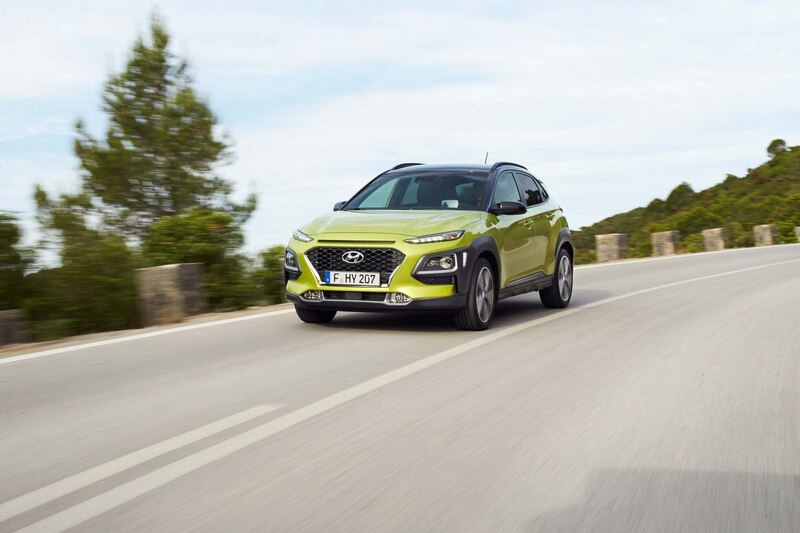 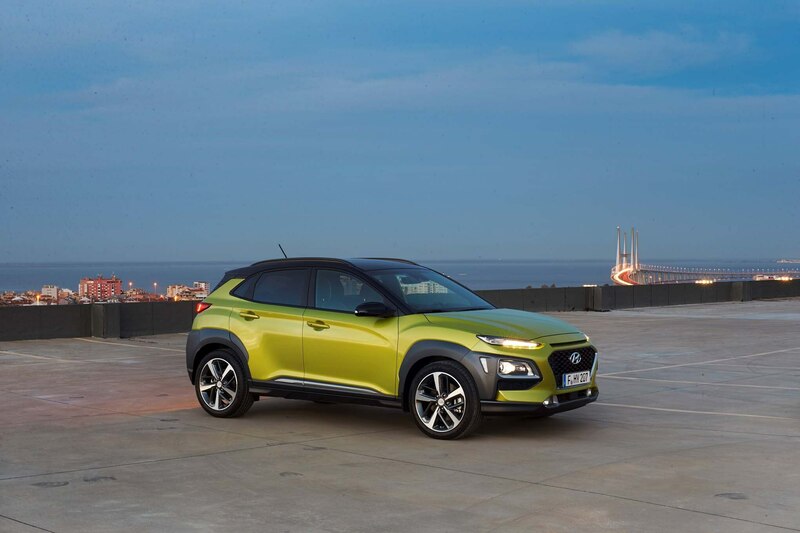 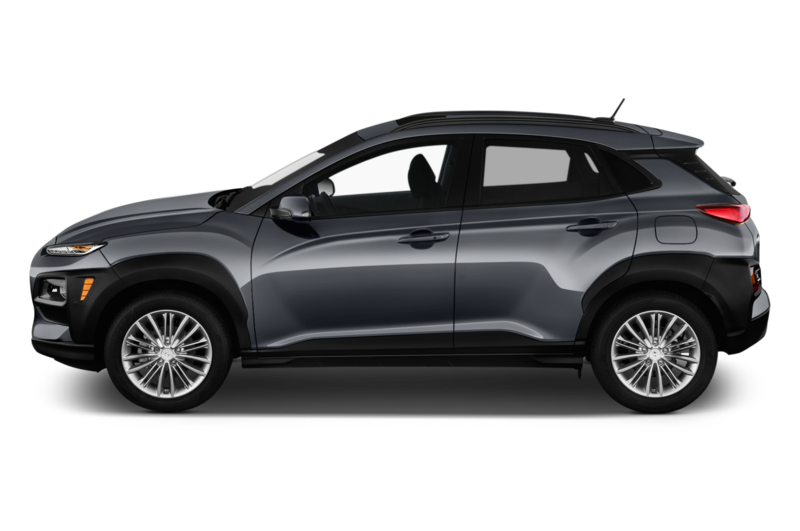 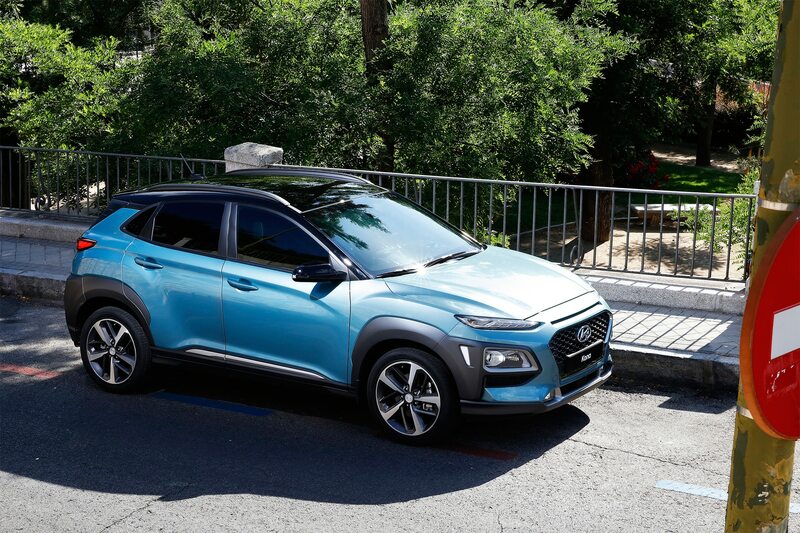 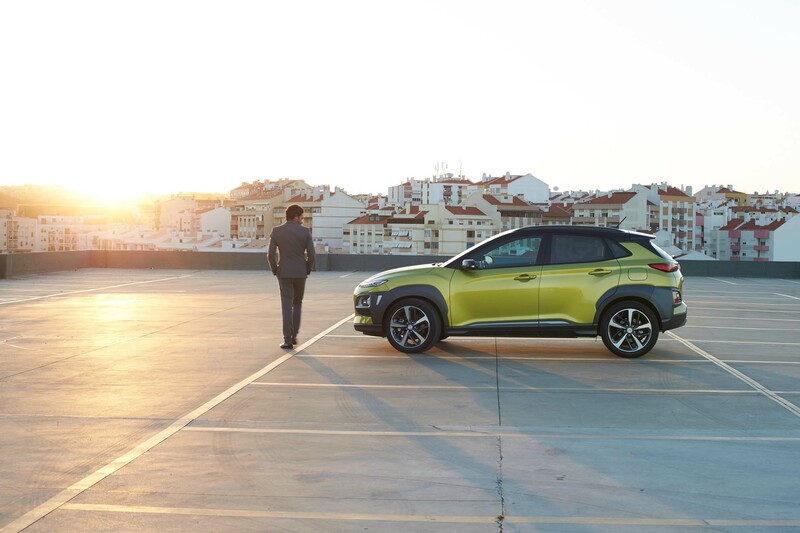 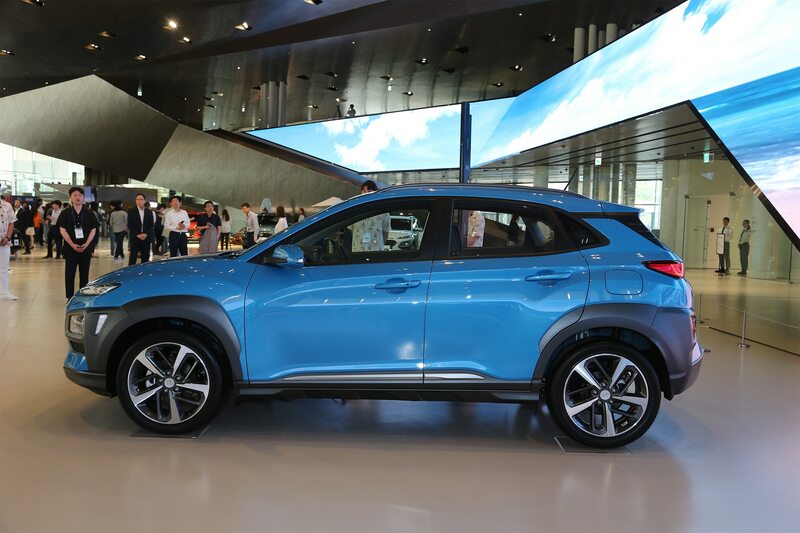 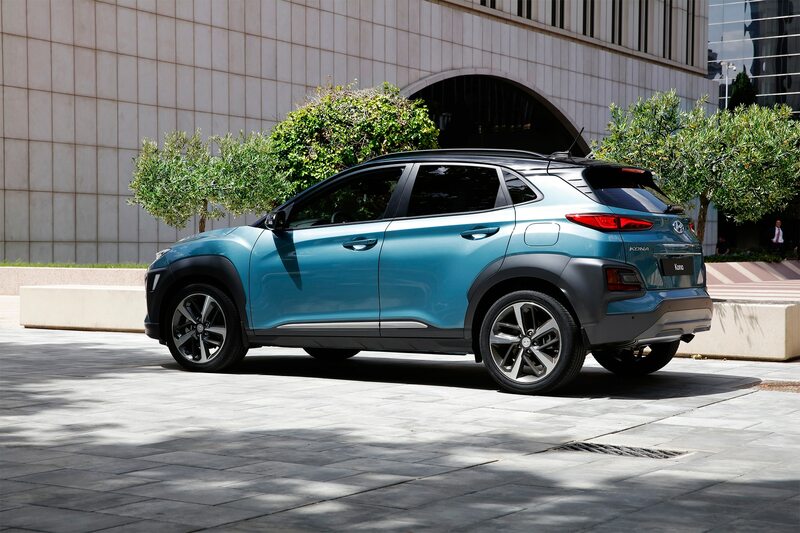 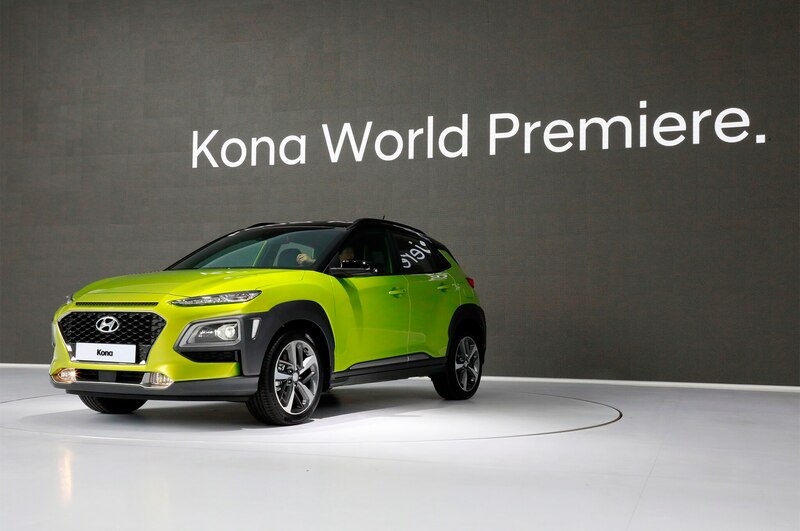 Hyundai says the Kona rides on an all-new global B-segment platform, which is 0.7-inch lower and wider than that of its Creta subcompact crossover, which has been on sale in emerging markets for a few years. 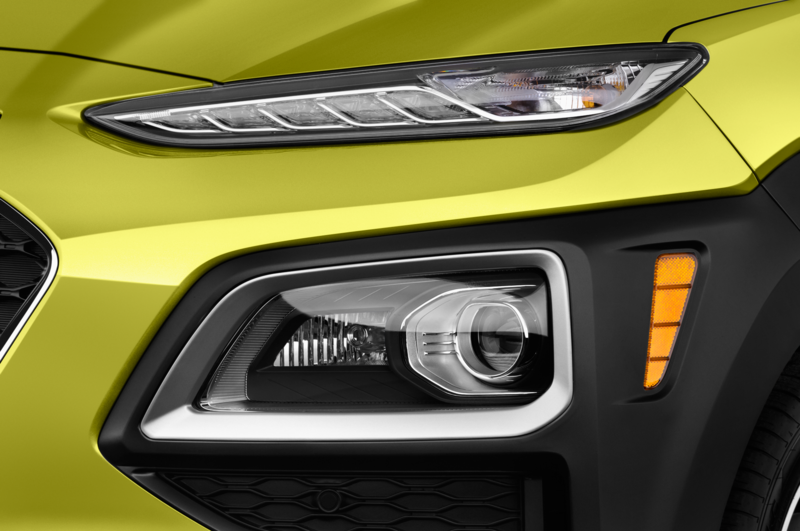 Executives were tight-lipped when it came to details about the platform or what it might yield down the road, but it did come out that some future B-segment sedans could adopt the new architecture. 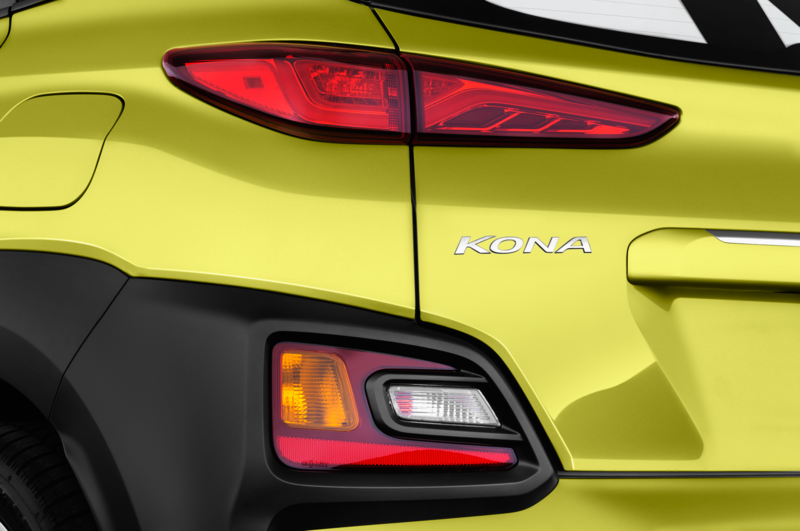 Bare-bones Kona SE models will come standard with power seats, cruise control, 16-inch aluminum wheels, a 7-inch touchscreen, and an old-school ignition key. 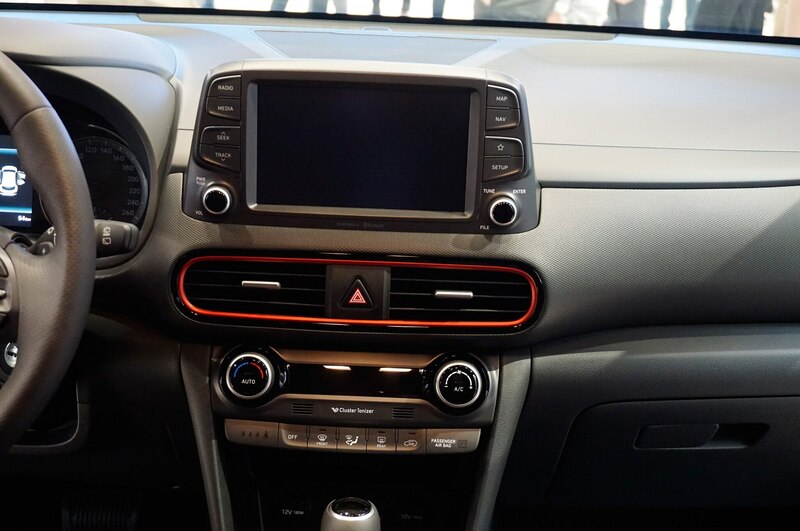 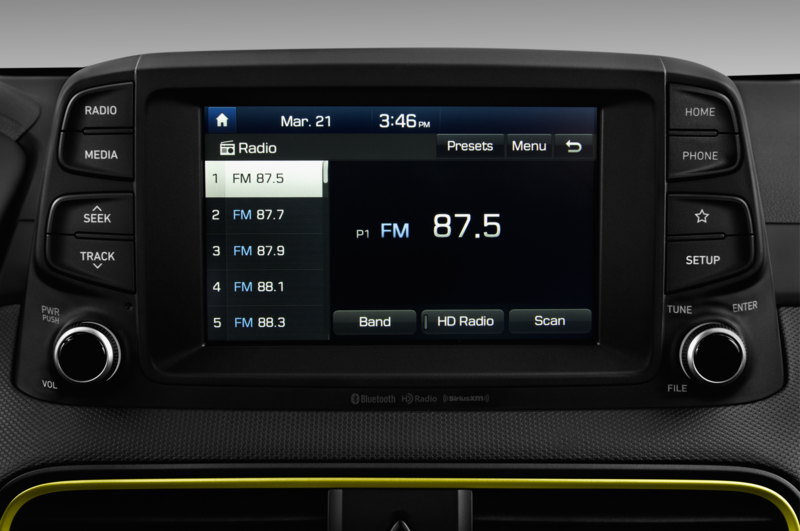 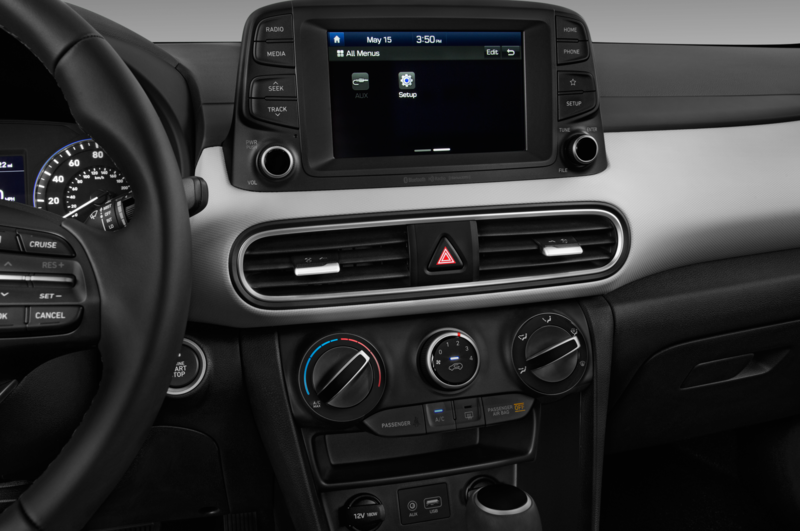 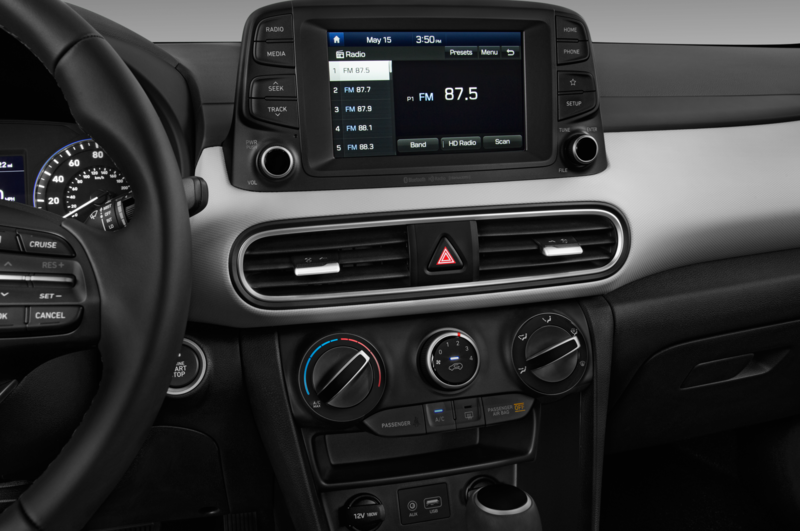 Bluetooth and Apple CarPlay/Android Auto is standard, as well. 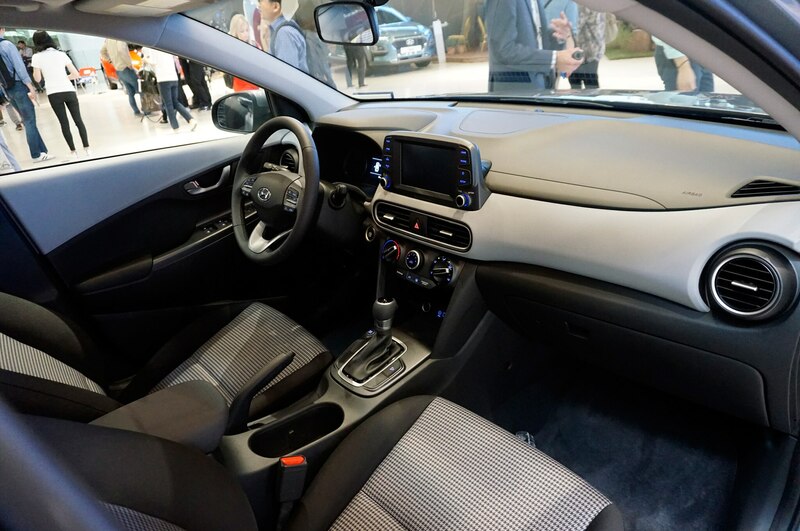 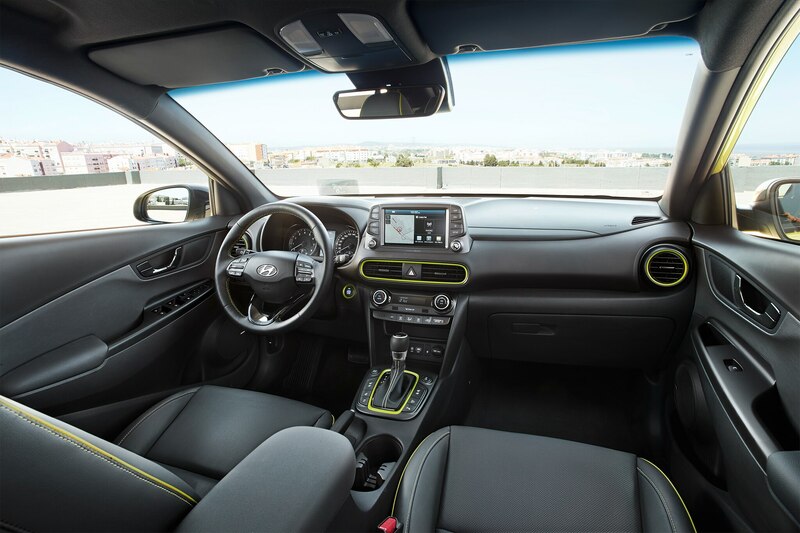 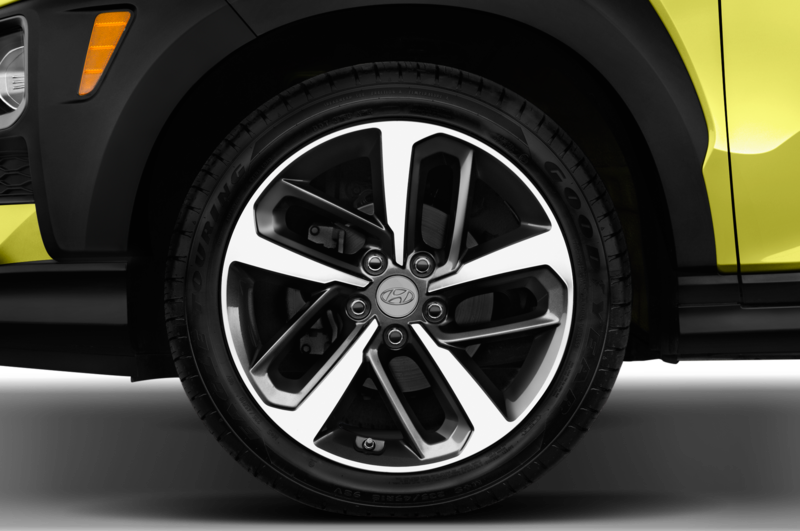 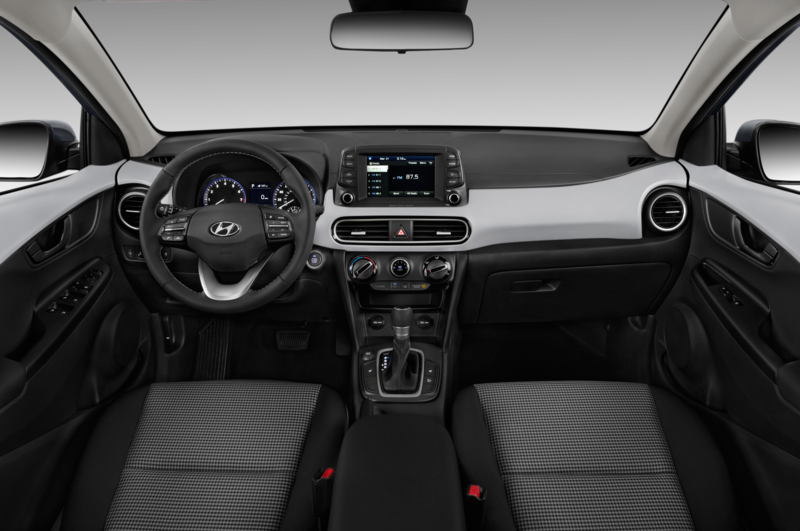 From there the SEL trim adds 17-inch wheels, roof rails, push-button start, a leather-wrapped steering wheel, rear cross-traffic alert, and an optional package with automatic emergency braking. 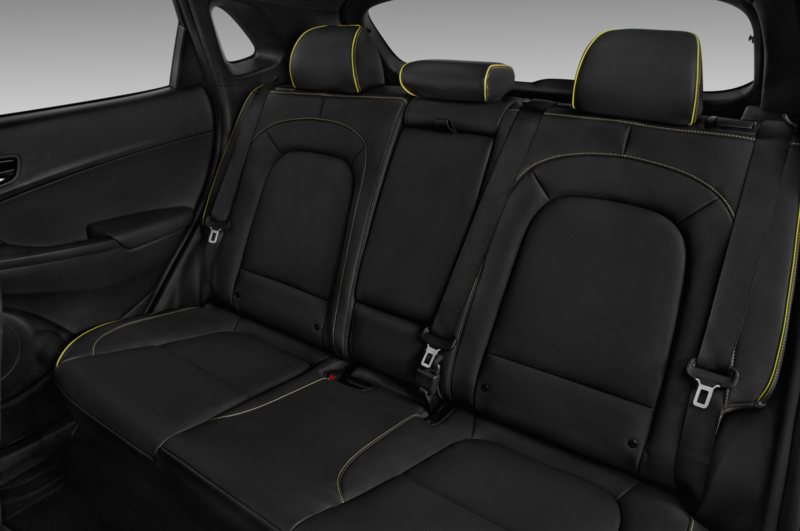 Spring for the Limited version to get a leather interior, sunroof, and LED headlights and taillights. 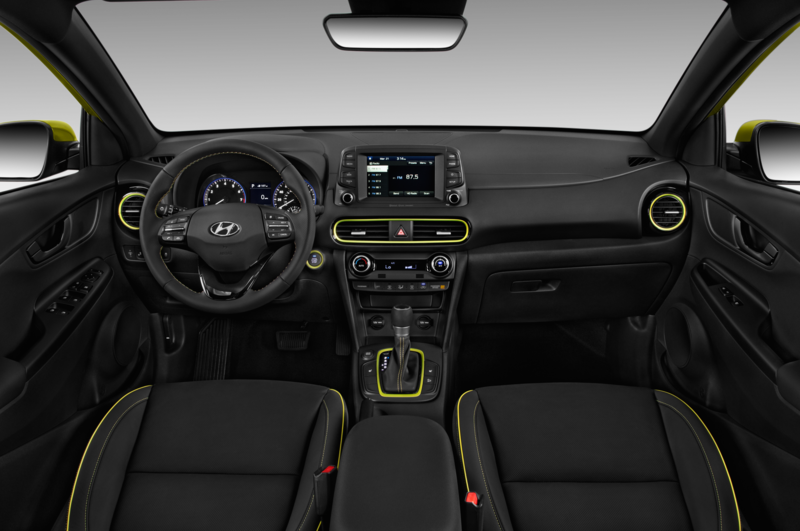 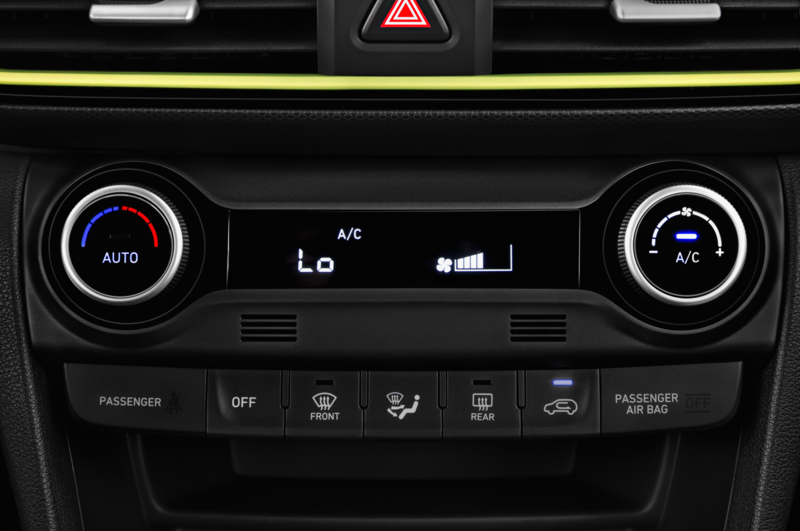 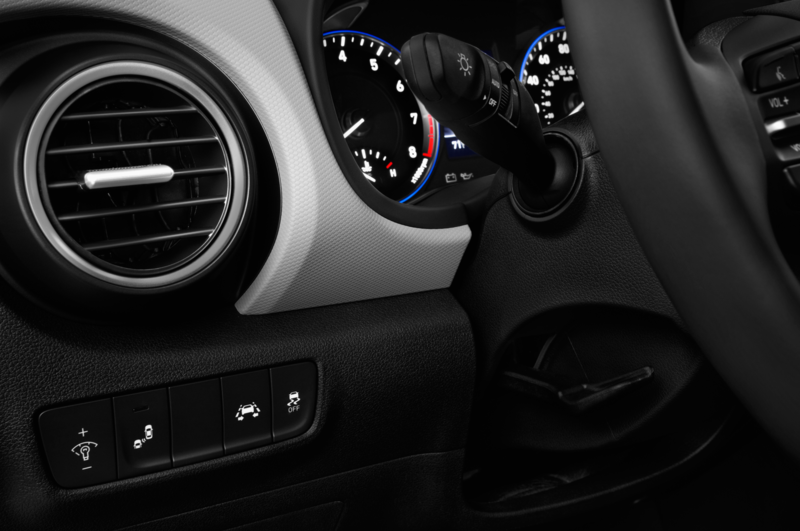 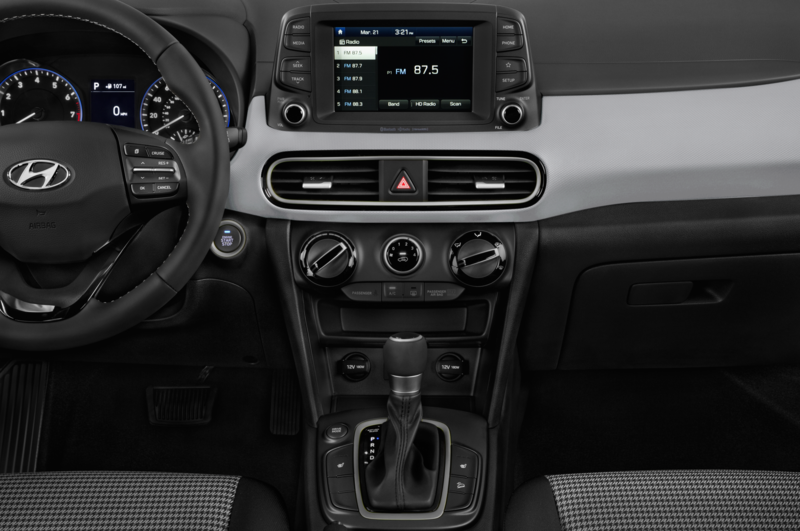 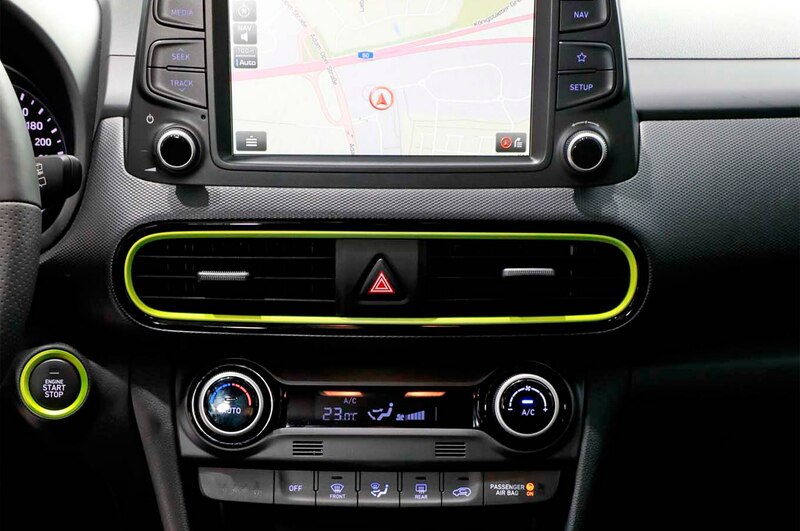 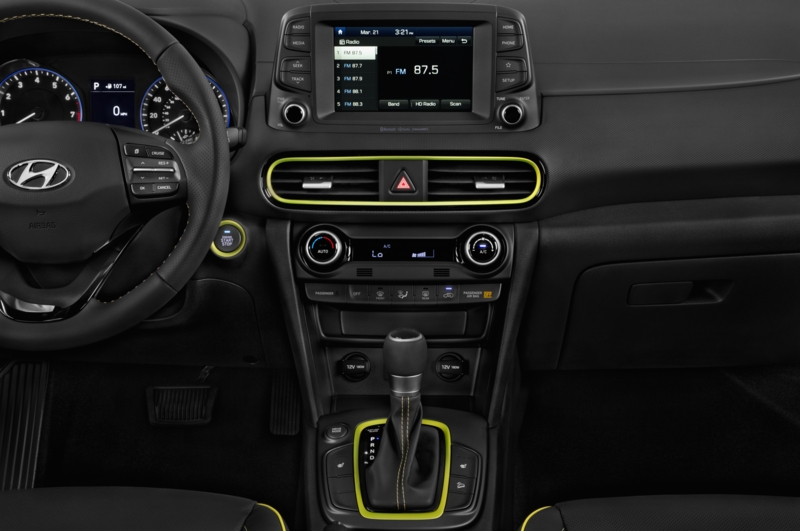 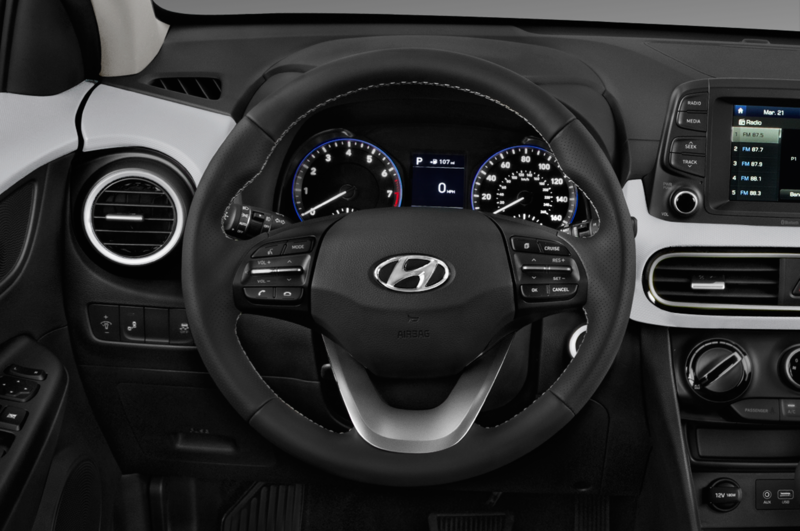 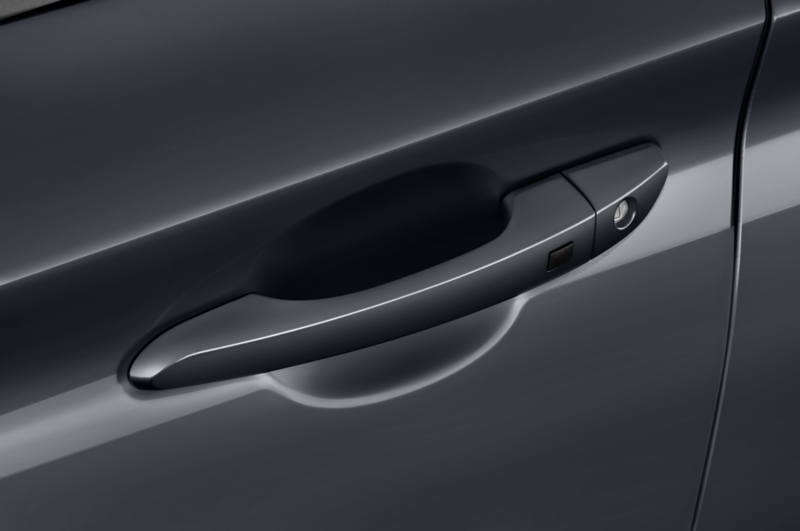 Goodies for the top-spec Ultimate trim include a 8-inch screen with navigation, lane-keep assist, rear parking sensors, automatic emergency braking, and a phone-charging pad. 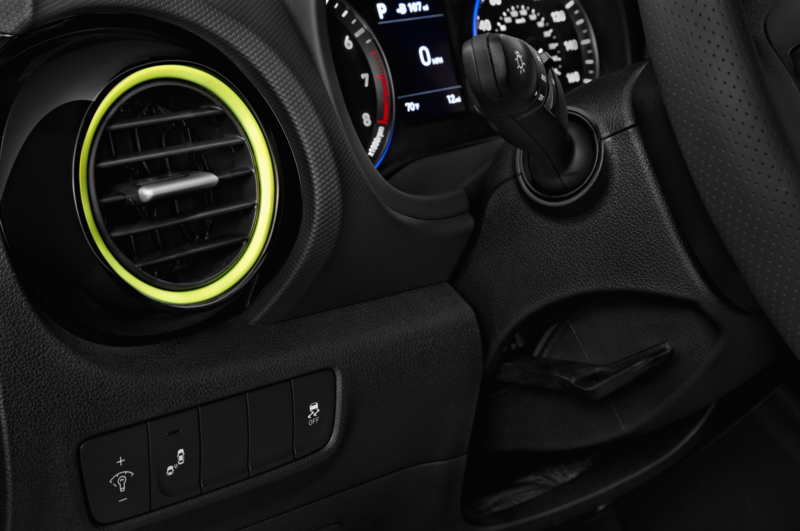 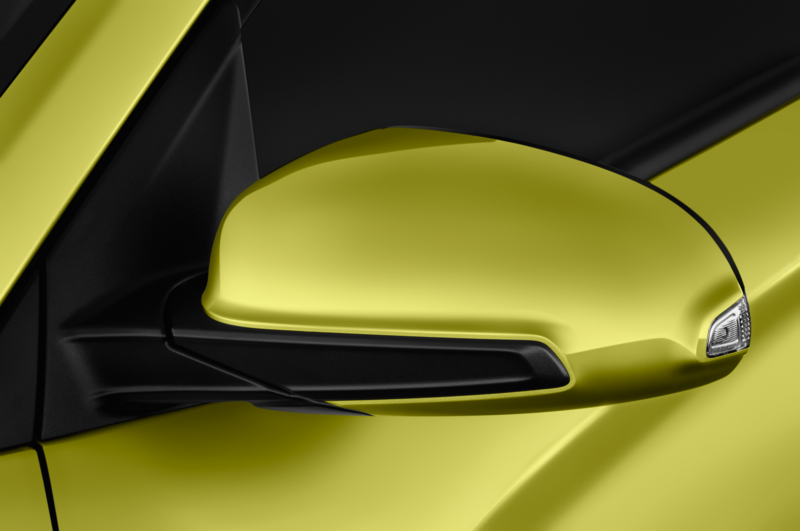 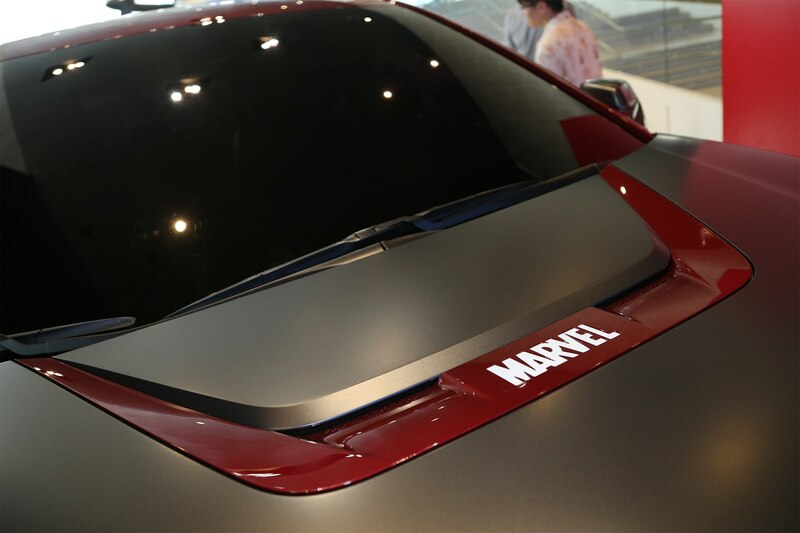 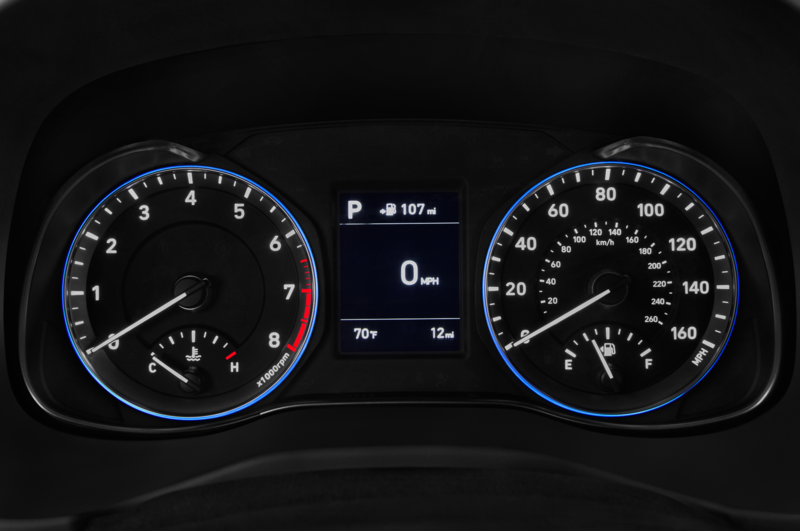 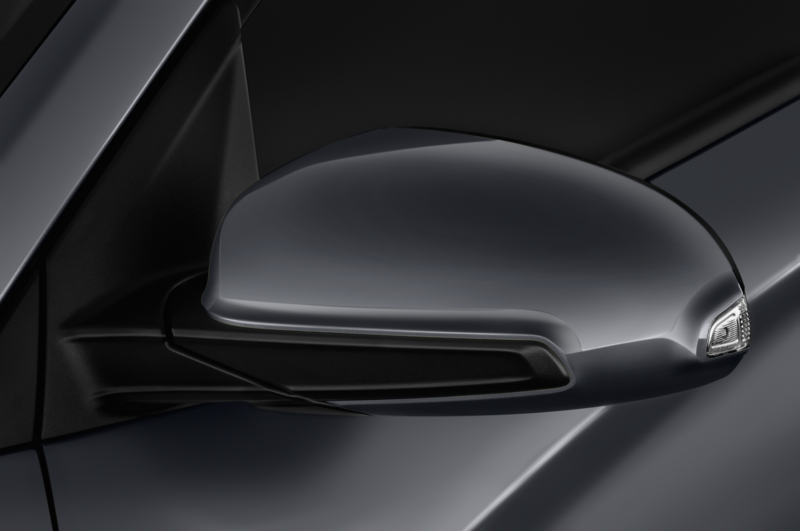 There will also be an available color head-up display, which flips up from the dashboard in a fashion similar to the Mazda3 or Mini Cooper. 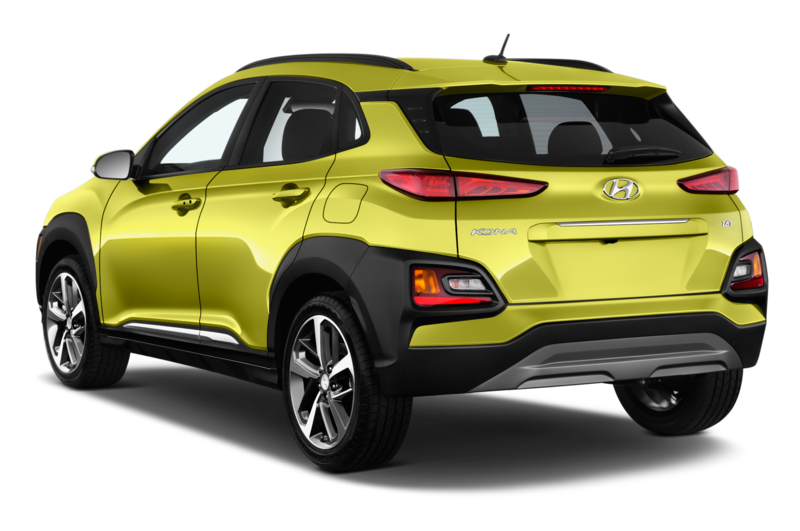 Pricing won’t be announced until closer to launch, but Hyundai’s U.S. public relations team says it’ll be positioned competitively, and cheaper than the $23,460 Toyota C-HR. 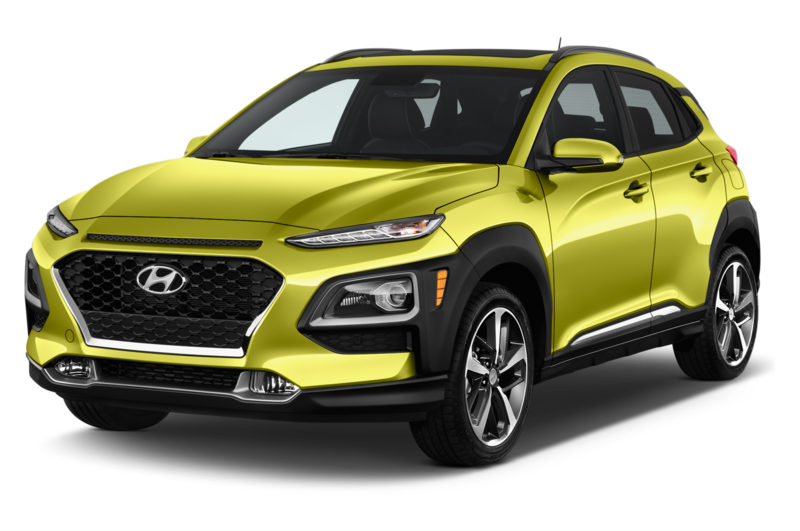 Expect the base model to start at about $20,000. 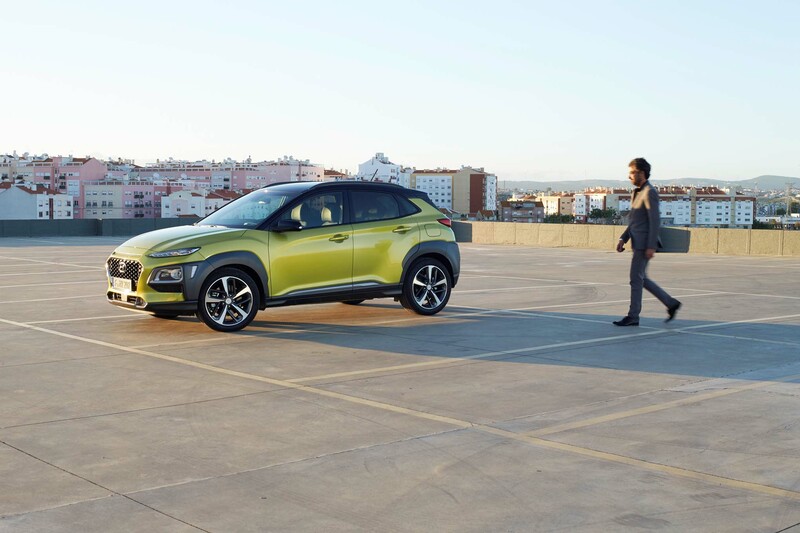 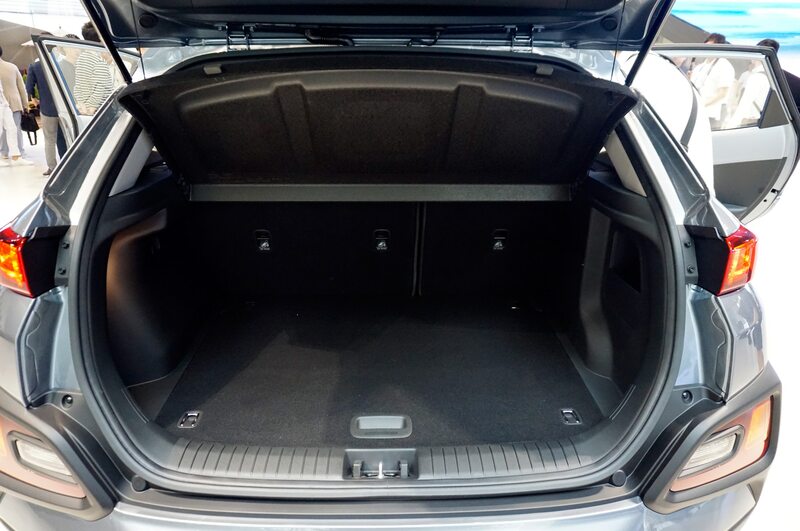 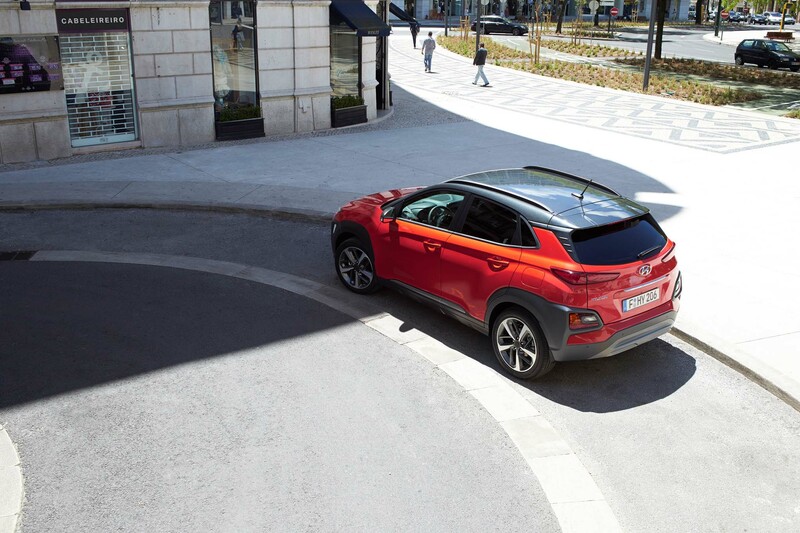 With its good chunk of available gear, not to mention the pedestrian-detection safety technology that’s something of a rarity so far in this space, the 2018 Hyundai Kona should present a perfectly valid alternative within a space that’s becoming ever more crowded with choices. 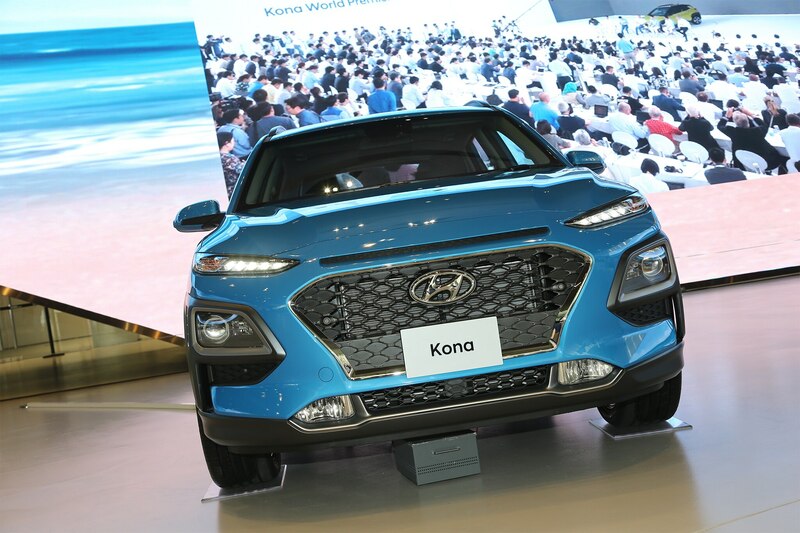 It’ll be the first strike in Hyundai’s planned SUV product assault, which will include a smaller crossover below the Kona as well as a three-row family SUV above the Santa Fe.